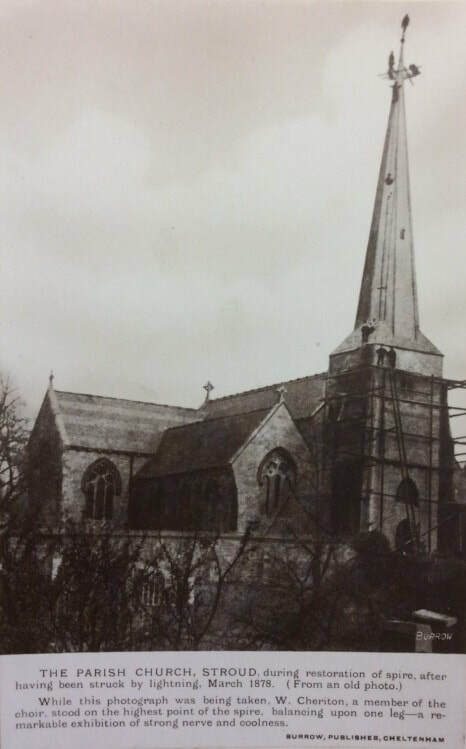 An extensive refurbishment and rebuilding of churches was taking place during the mid-1800s, against a background of poorly maintained buildings, a reaction against the continuing rise of non-conformism, and a perceived shortage of churches in the growing urban areas. 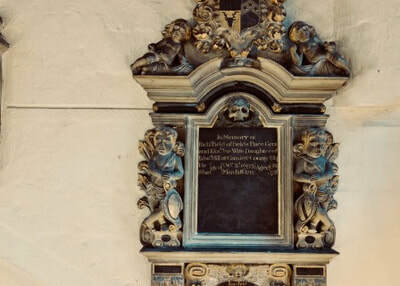 The Cambridge Camden Society and the Oxford Movement were at the forefront of a drive towards a more medieval attitude to churchgoing, and the change was embraced by the Church of England which saw it as a means of reversing the decline in attendance. 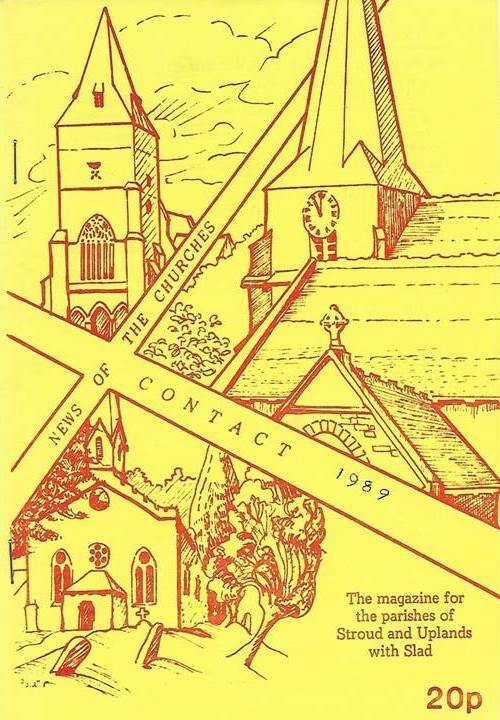 The Cambridge Camden Society advocated a return to a ‘correct’ form of building based on churches which had been built during the hundred years centred on 1300. 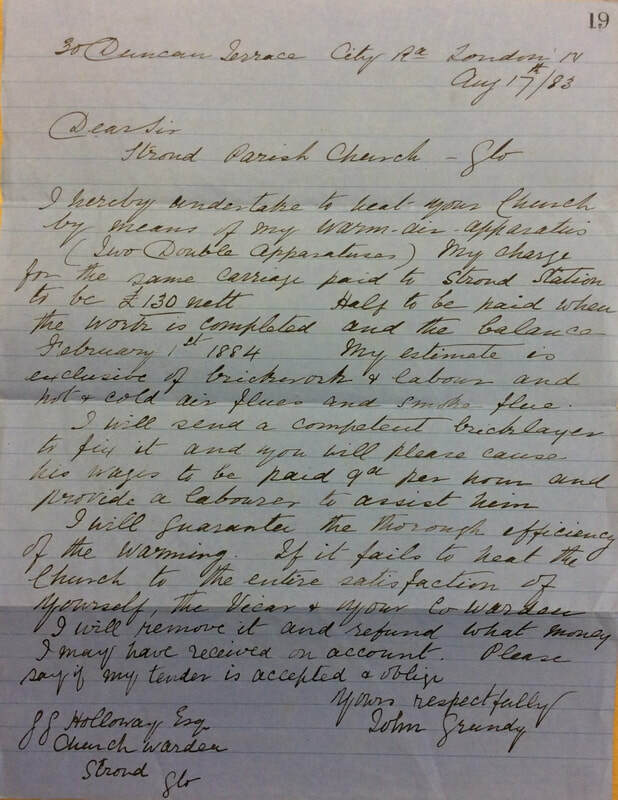 If a church could not be ‘restored’ to this original state, then it was a candidate for a complete rebuild. 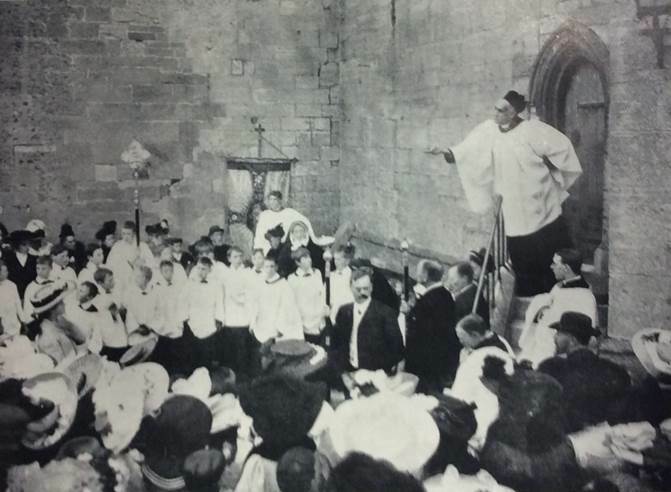 The Oxford Movement advocated moving the centre of importance in the church from preaching to the sacrament of the Eucharist; from the pulpit to the altar. 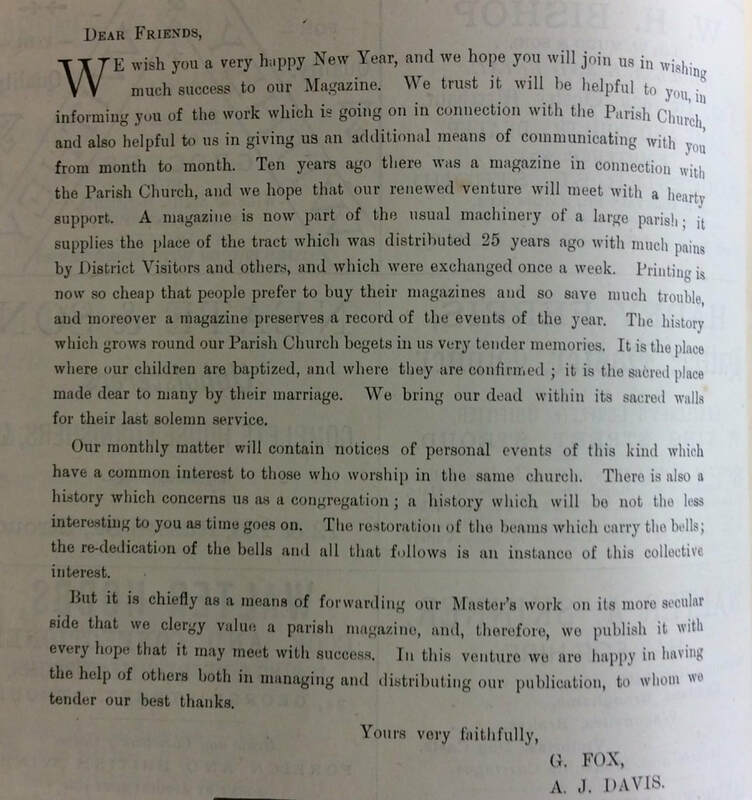 Consequences of this included moving the pulpit from a more central position to the side of the church, replacing box pews with open pews, creating a central aisle to give a better view of the altar, the removal of galleries, and a larger chancel. 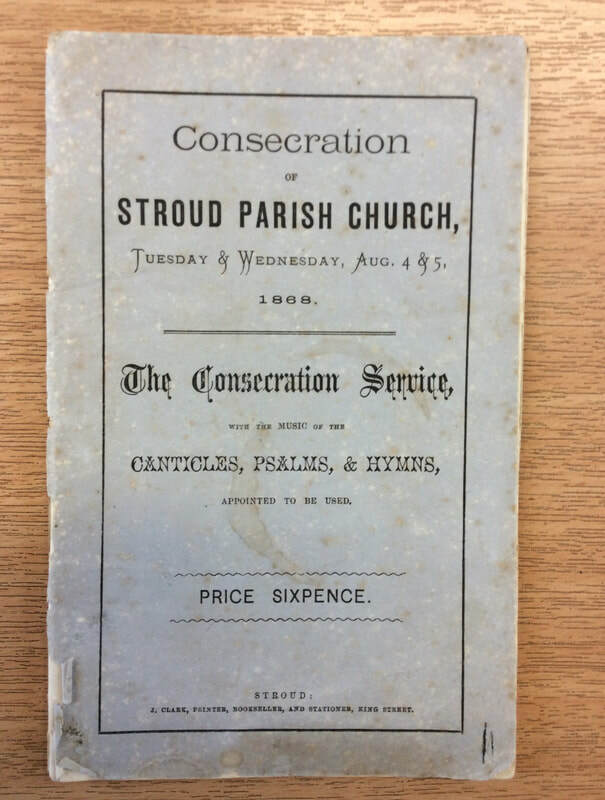 A total of 3,765 new and rebuilt churches were consecrated in the 40 years up to 1875, with the most active decade being the 1860s, in which there were more than 1,000 such consecrations. 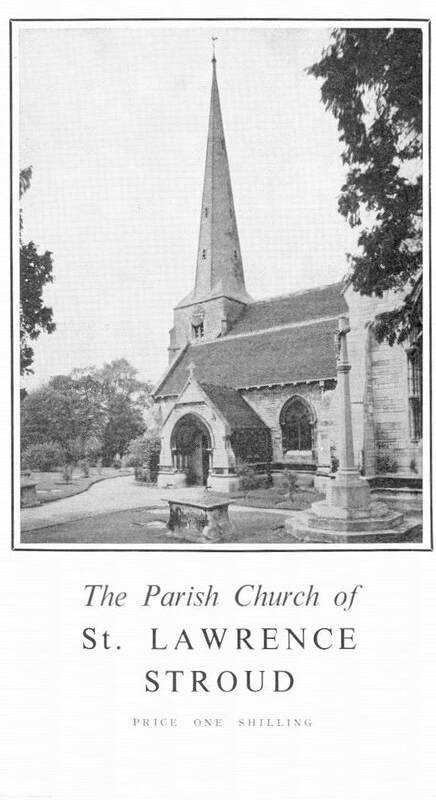 Over 7,000 parish churches in England and Wales (nearly 80% of the total) were restored in some way between 1840 and 1875. 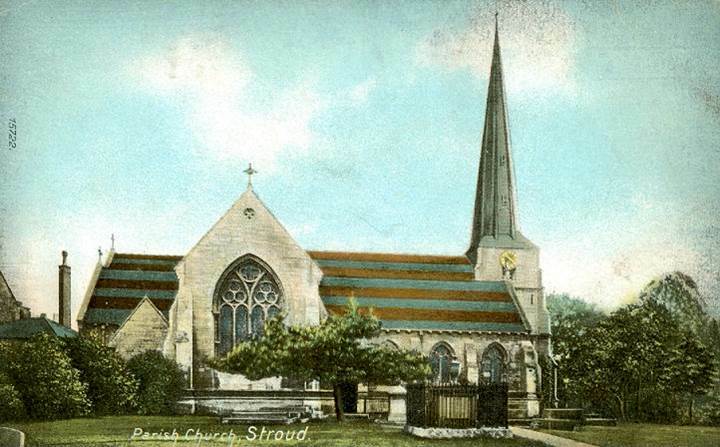 Stroud was not immune from these developments, and in 1866, under the incumbency of Rev John Badcock, the whole of the existing parish church, with the exception of the original 14th century tower and spire, was pulled down and rebuilt. 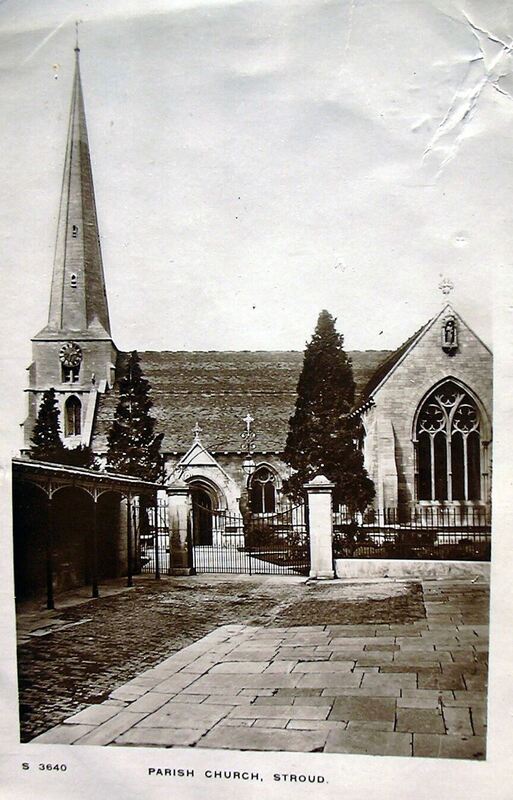 The new church was consecrated and re-opened for worship by the Bishop of Gloucester and Bristol, Bishop Dr Charles J Ellicott, in August 1868. 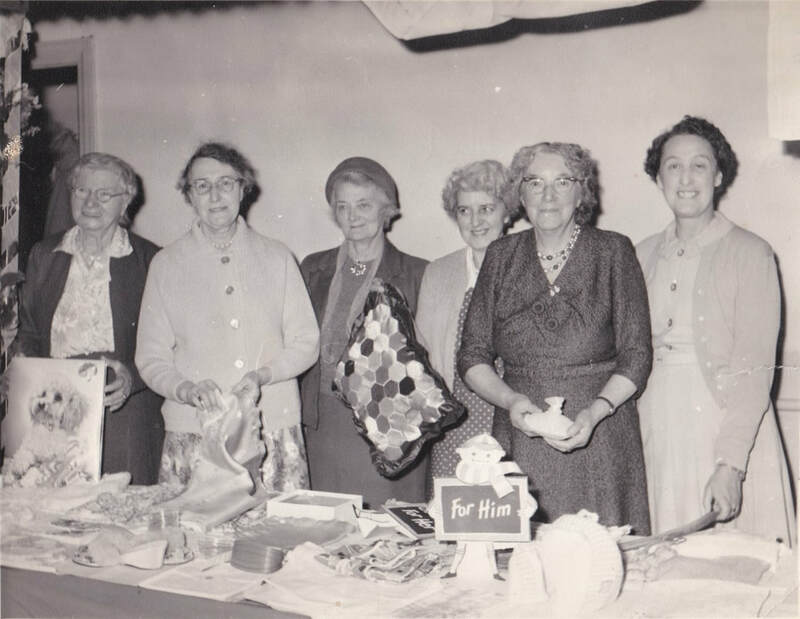 A celebration dinner for the aged poor was also held in the Subscription Rooms. 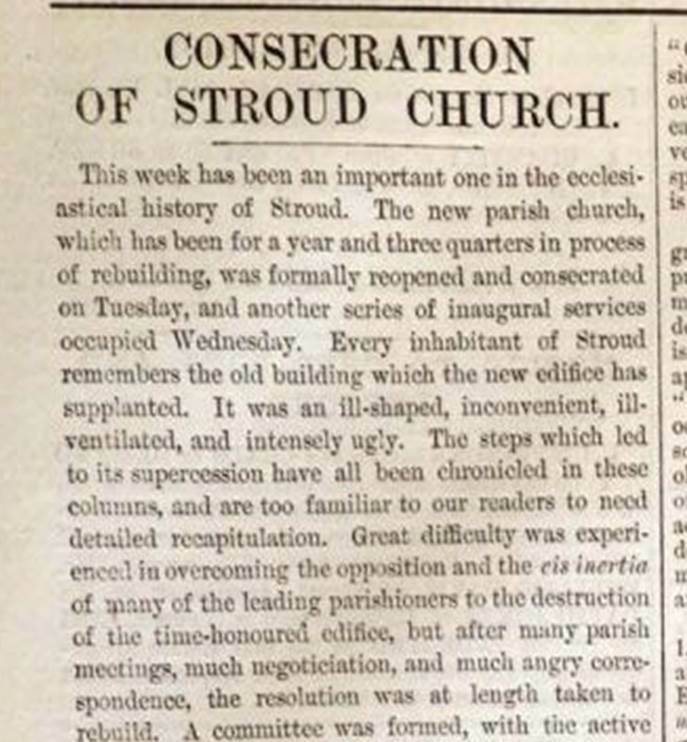 "The rebuilding of Stroud Parish Church, which was completed in 1869, was, perhaps, the most formidable task carried out by Wall and Hook. 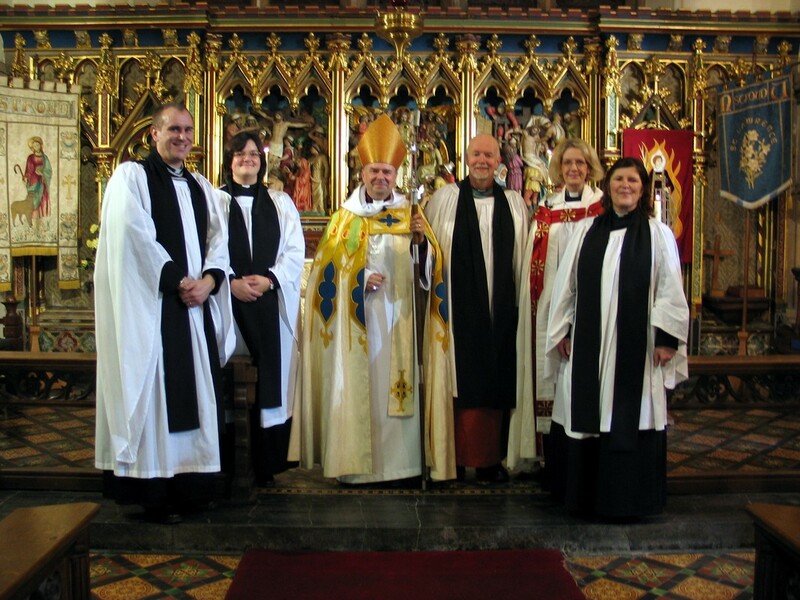 Ten years before, the vicar, the Rev. 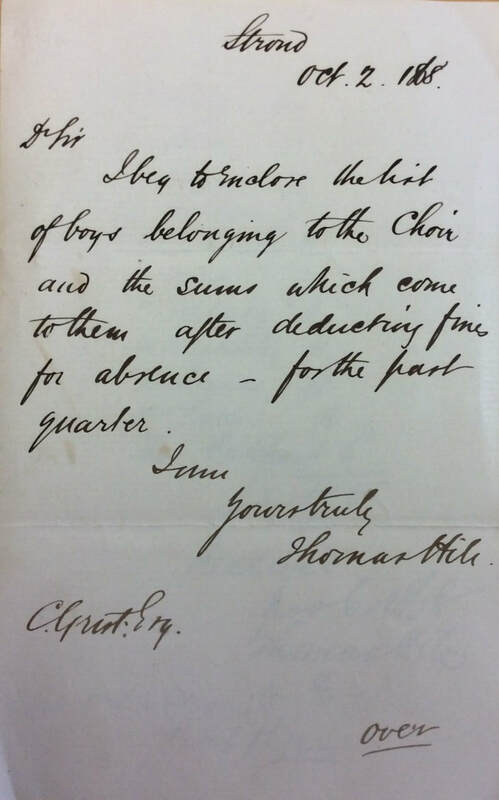 T. H. Tarlton, had found that on Mondays “he generally felt as if all the vitality had gone out of him, owing to the imperfect ventilation but it was the conditions in the chancel which caused him most dismay. 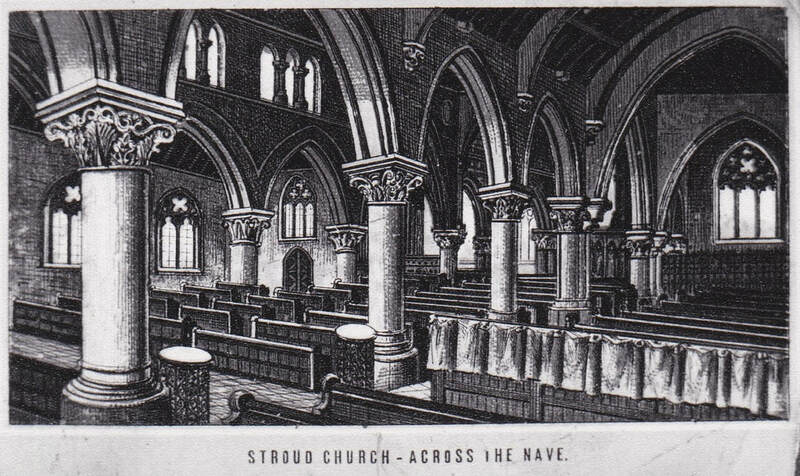 “It was his duty” the Stroud Journal reported, “to sit in the chancel if he was not reading prayers, but he never sat there without having an abhorrence of the place. 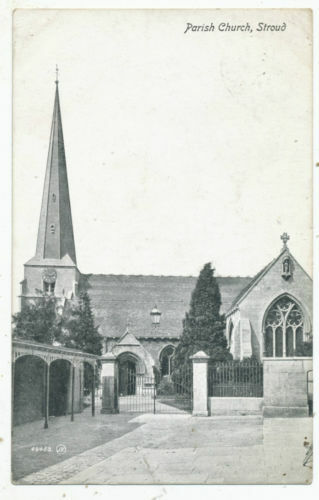 He was sitting below the soil that contained the dead, under the drainage of the churchyard........there was a great amount of damp and effluvia from the graves all round the eastern end”. 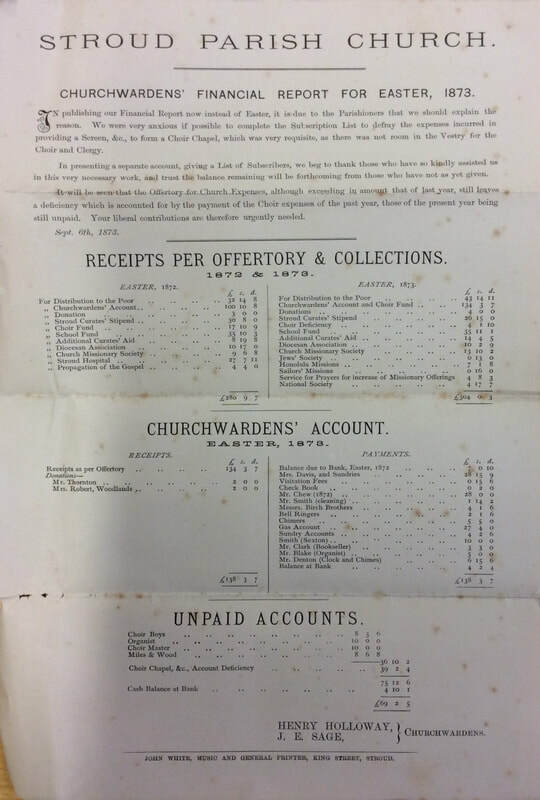 There were also complaints of impurities arising from the vaults, immediately under the noses of the congregation and that in the vaults under the chancel coffins were floating. The north wall was bulging ominously and the roof needed attention. One of the galleries was unsafe. The seating came in for strong criticism. One third of the congregation had to sit with their backs to the minister, there were those who could get no farther than the porch and the poorer members were packed together, inhaling each other's breath, jammed knee to knee. 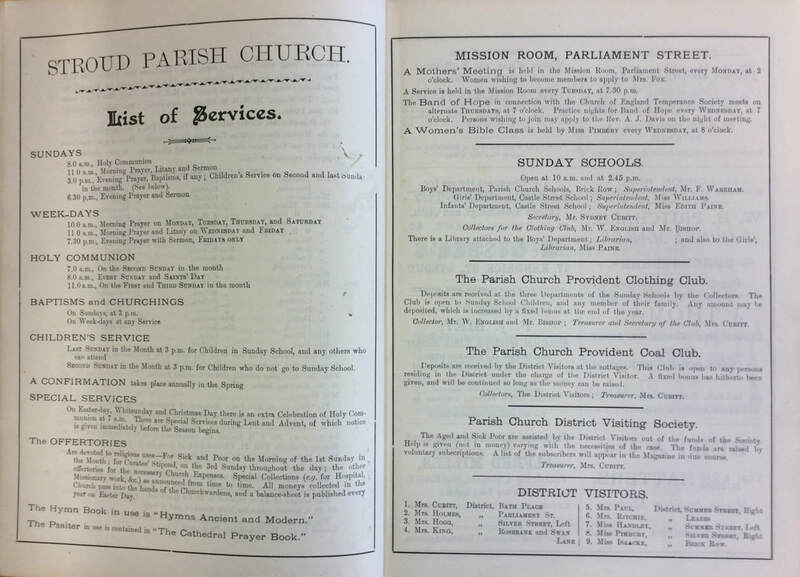 One of the principal critics was Dr. W. H. Paine, a church warden, who said “I would give liberally to support the parish church for parish purposes, but I shall not put my hand in my pocket to find coals and gas and comforts for those who are the landlords and owners of the pews”. 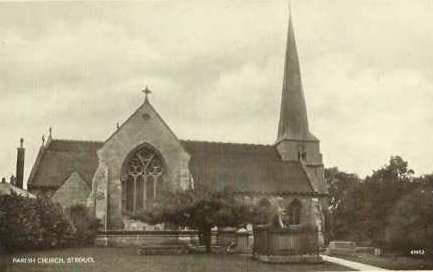 In the protracted dispute as to whether or not to proceed with the restoration , at one stage Dr. Paine referred to the “beautiful” church at Bisley, which had recently been restored (by Wall and Hook) where the service was conducted in a decent and orderly manner and proper accommodation provided for all the parishioners, even the poorest - “and this, too, in the little town of Bisley, which we have been almost accustomed to despise. Then we look at our church in Stroud – dirty, ill-ventilated, inconvenient, and delapidated, we can hardly help feeling ashamed of it”. 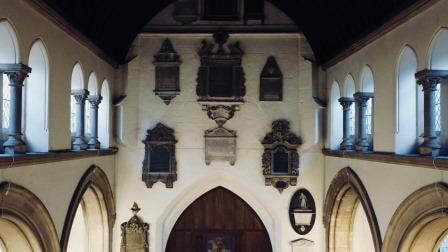 The same, alas, could not be said of Bisley Church today; for some years now the walls of the nave have looked very shabby, while Stroud has maintained in sound condition the good work carried out by Wall and Hook. 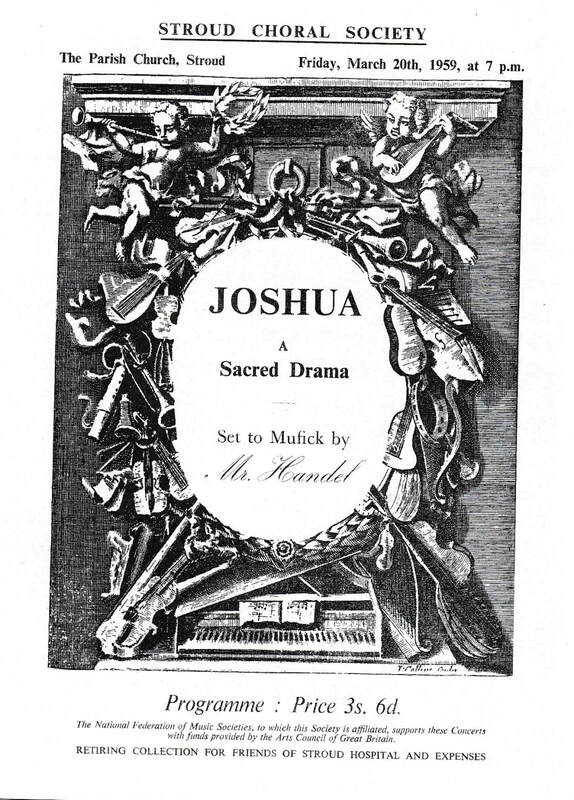 Much of the stonework was the responsibility of Joshua Wall, the sculptor, who was soon to die on December 21st. 1869 at the age of 34. An exhibitor at the Royal Academy in his time, his last work was for the Grand Pump Room Hotel, Bath." 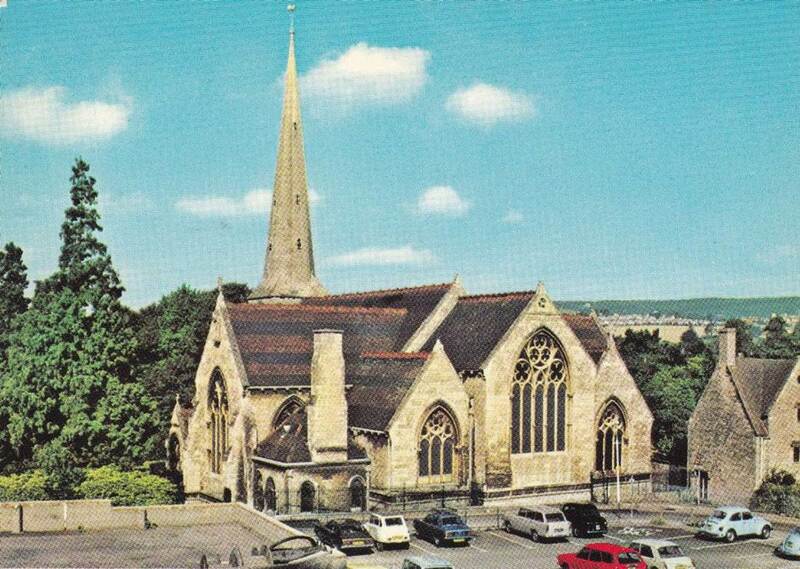 ​The architects for the new church were Wilson & Wilcox of Bath, and it was built by Geo Wall and Henry Hook of Brimscombe (established in 1845), using stone from Bisley and Bath, and a roof of Broseley tiles in blue and red bands. 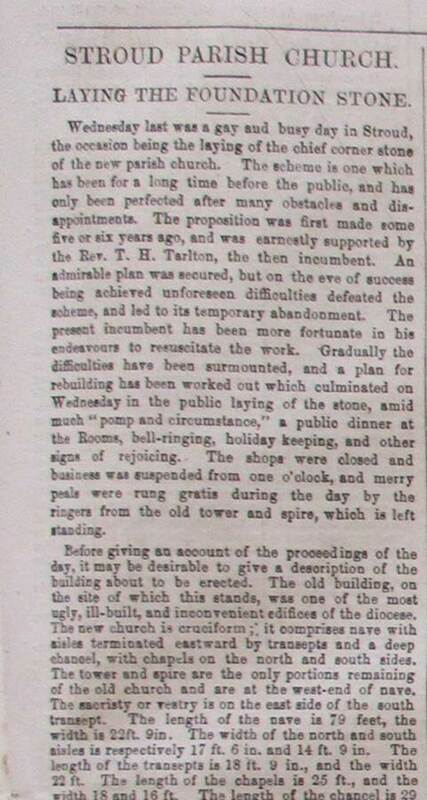 The cost was met by public subscription, and the new building was said to be able to seat at least 1,150 persons. 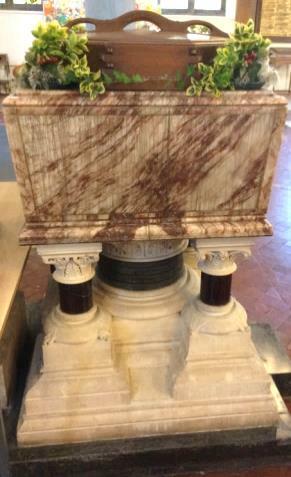 The carving and ornamentation were carried out by Joshua Wall of Stroud, who also made the pulpit and font. 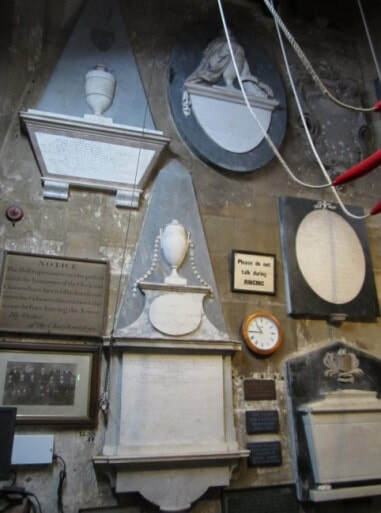 Wall, born in Kings Stanley in 1835, was known for his very high quality sculptures, with over one hundred monuments to his credit — many of which can be seen in Stroud Cemetery and St Laurence Church. 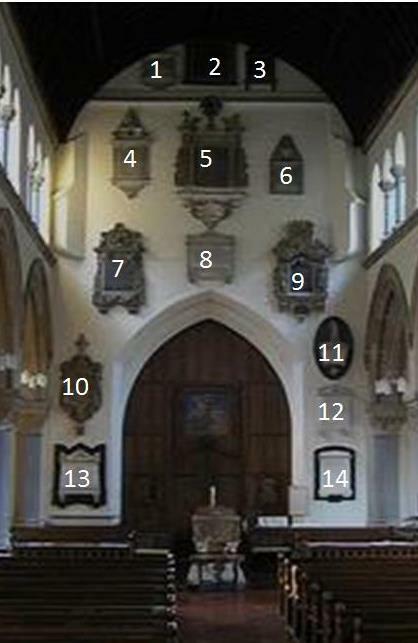 The latter include the figure of St Laurence on the outside of the south transept, over a gable window, and all the other carvings on the inside and outside of the church, including the pulpit and font, which were designed and carved by him. He died in 1869 and was buried in Stroud Cemetery. 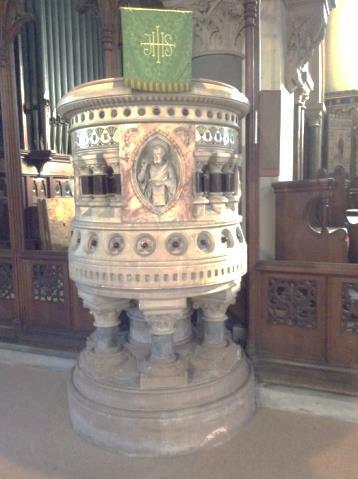 ​The font cover was by the locally-settled Dutch cabinet maker Peter van der Waals (1870-1937). 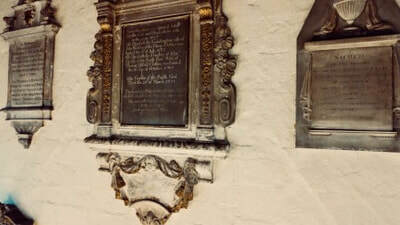 ​Many of the original monuments and memorials were saved and incorporated into the new building – many of them into the west wall of the nave, and the ringing chamber of the tower. The chancel floor tiles of the new church were by Godwin of Lugwardine. 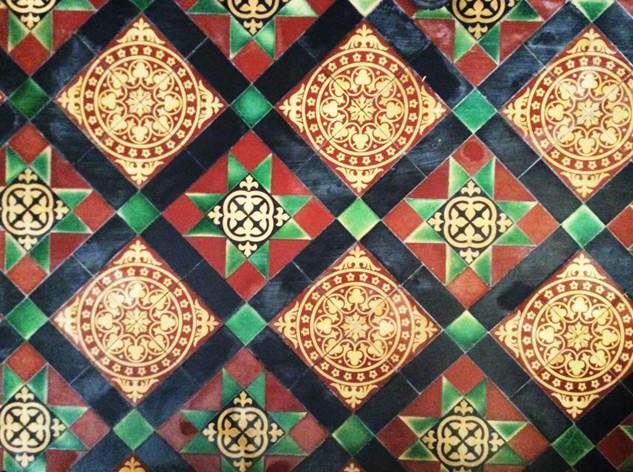 In 1852, William and Henry Godwin began creating ‘gothic’ tiles by the encaustic process century at his factory at Lugwardine in Herefordshire, and became one of the leading manufacturers in the nineteenth century, supplying the demand for churches, railway stations, schools, municipal buildings and suburban villas. 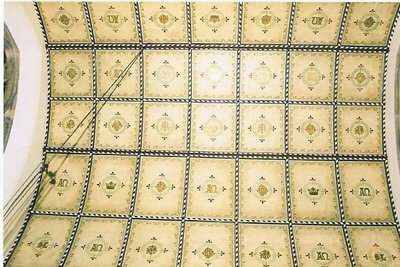 The company's products appealed to church architects as they were very close in style to original medieval inlaid tiles. Eventually the company also made dust-pressed encaustics and relief moulded tiles. 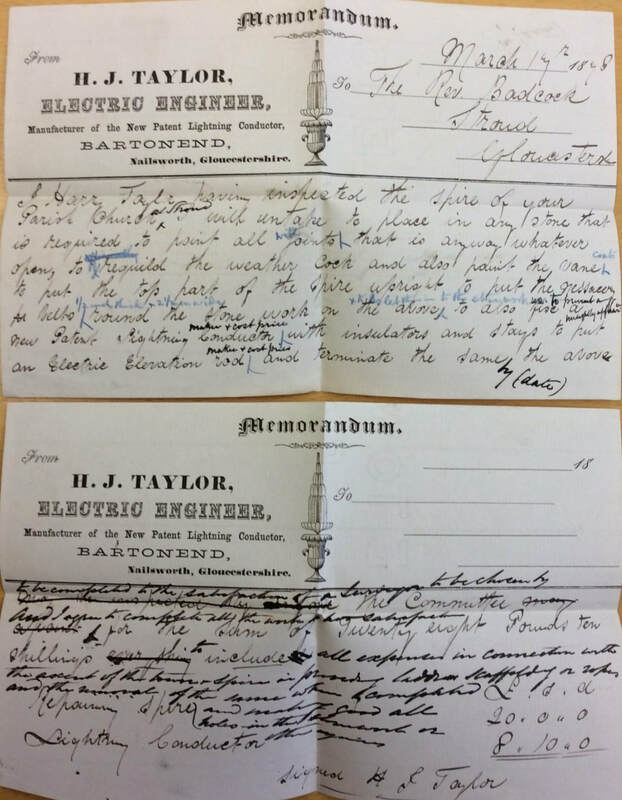 They went out of business in 1906 when the works were sold to G H Lloyd and Thomas Pulling. 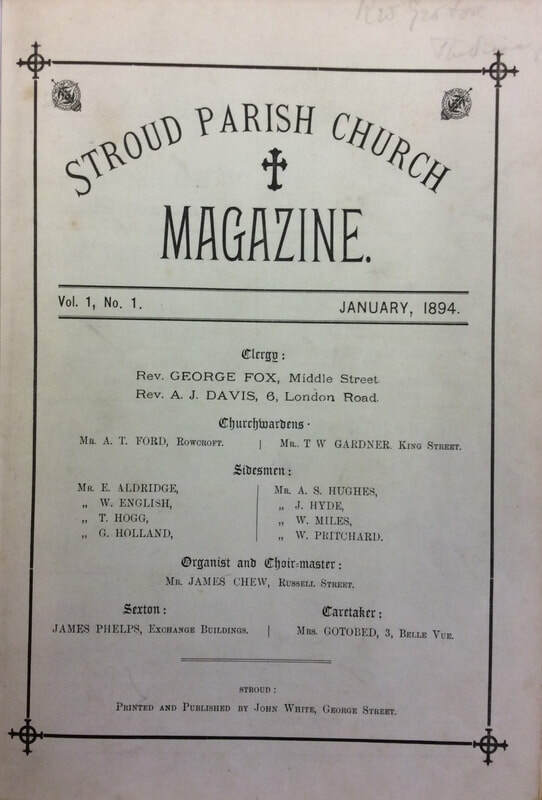 Much of what is known of the early history of the town, including St Laurence Church, is thanks to Paul Hawkins Fisher (1779-1873), who wrote a full and informative history called “Notes and Recollections of Stroud”, which was first published in 1871. 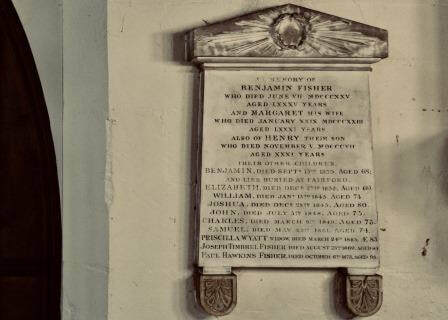 The Fisher family is commemorated in a memorial by the door into the tower. 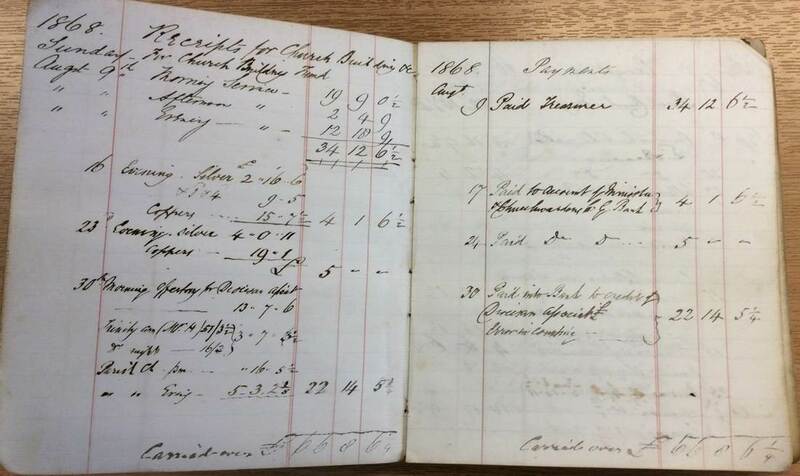 John Grundy (1807- 1879) was a grocer and flour dealer who lived in Tyldesley, near Manchester. 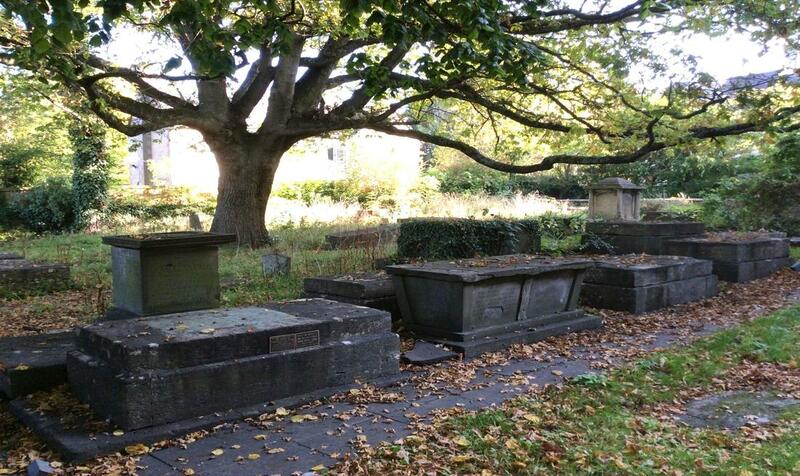 He was a churchwarden at his local church, and was most concerned at the discomfort he felt during the winter. So he set about resolving the problem by erecting a central heating apparatus by using a stove, flues, chimney and ventilators. 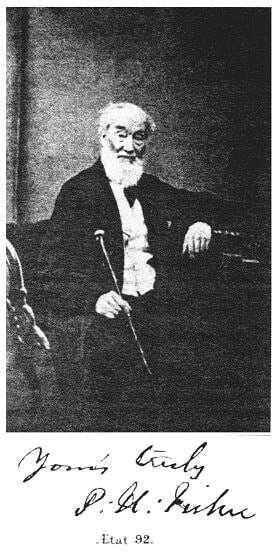 John Grundy Ltd was subsequently established in 1857, and he continued to improve his heating apparatus, increasing its efficiency and effectiveness, and additional Patents. 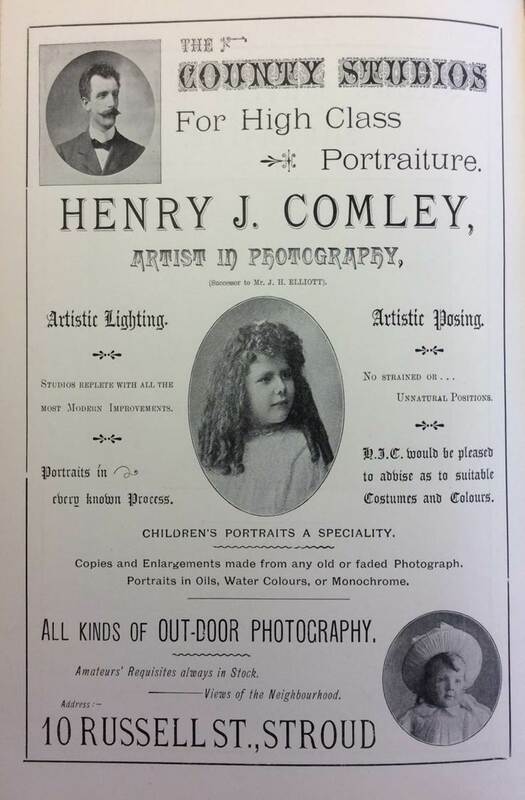 By the 1870s the firm had become a successful business, and his son, John Grundy Junior (1844-1913) (photo top left), decided that the firm should be based in London. 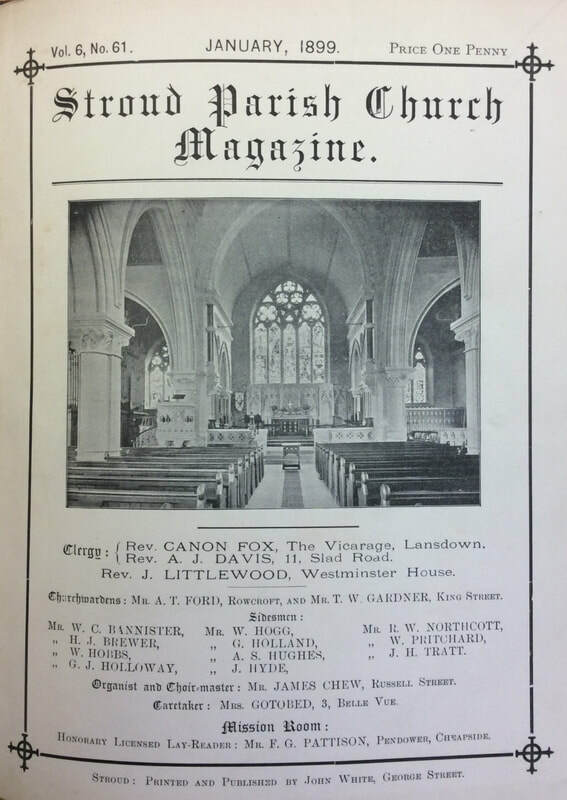 The Grundy warm air stove heating apparatus proved a great success and was installed in several cathedrals, and numerous churches and chapels throughout the country. 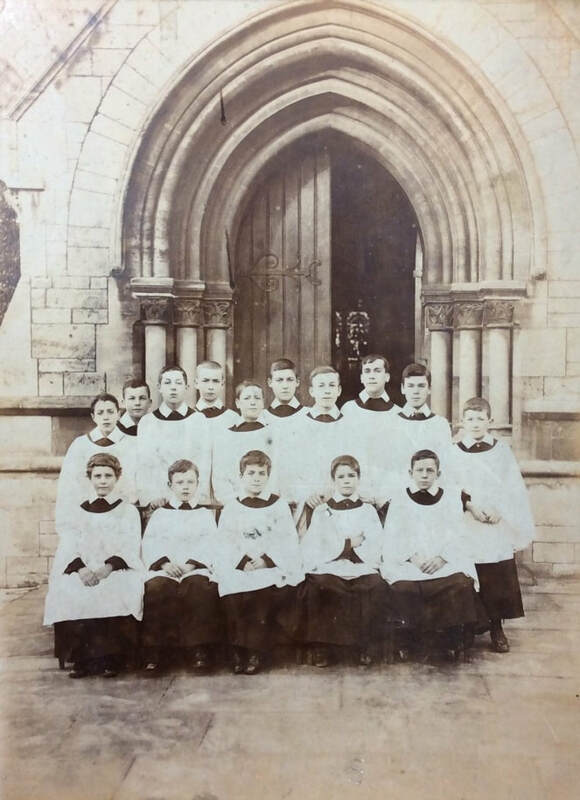 The new church was endowed with a fine series of Victorian stained glass windows at its rebuild between 1866 and 1868, which were gradually added to in the period up to 1922. 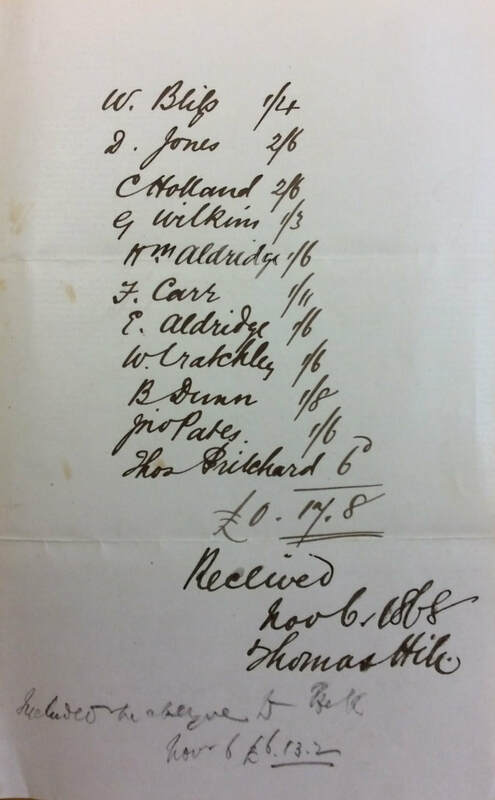 Makers include Heaton, Butler & Bayne, Lavers & Barraud, H Hughes, Ward & Hughes, and JCN Bewsey. 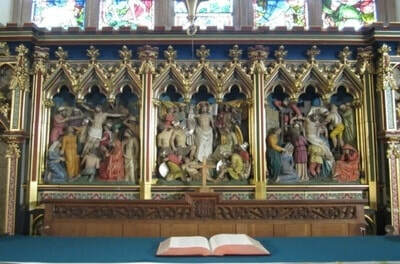 The fine reredos was designed by George Gilbert Scott Junior in 1872, and was carved by Morris Geflowski, with high relief panels of Gethsemane, the Crucifixion and Deposition by Edward Geflowski. 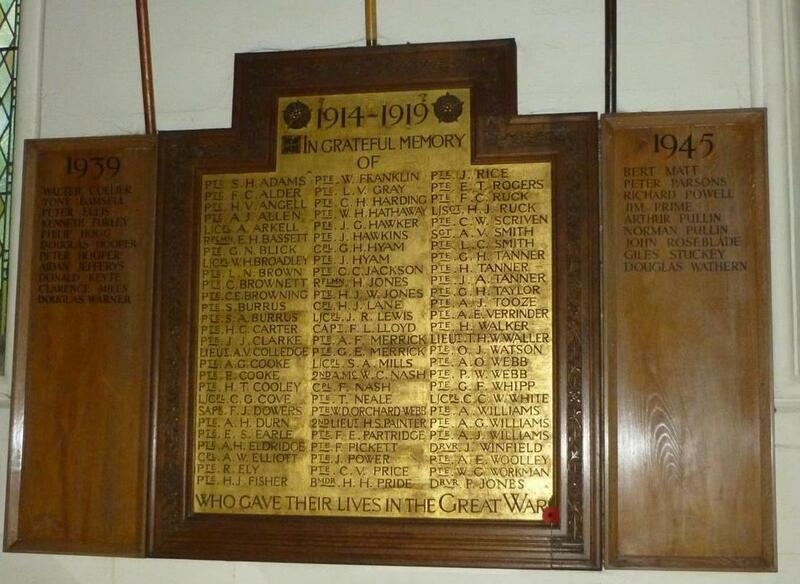 It was coloured and gilded in 1970 in memory of Charles Aldridge and Henry Philpotts. 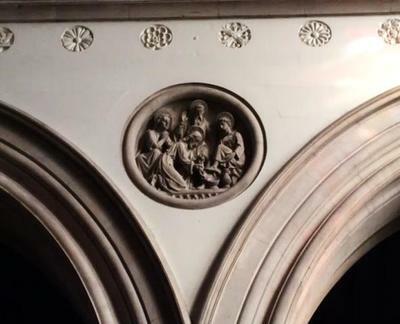 The chancel ceiling decoration is believed to have been originally painted in the early 1900s. It has 56 panels, each decorated in gold leaf with one of five symbols. 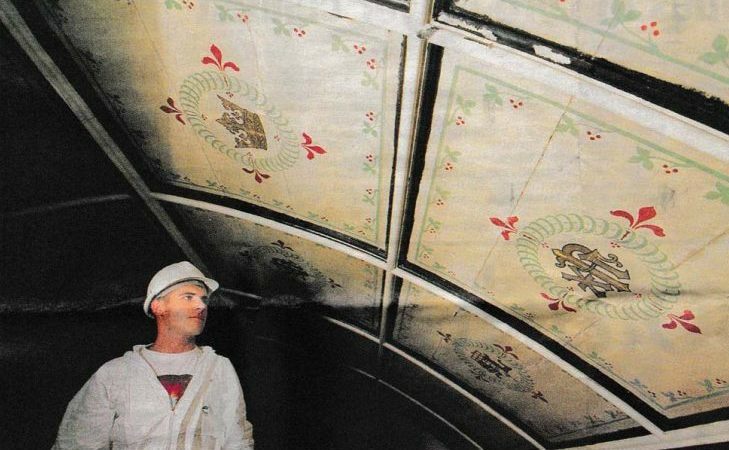 The ceiling was cleaned and repaired in October 2001. The five symbols used are: Alpha and Omega, the first and last letters of the Greek alphabet; the first three letters in Greek of the title Christ; a crown, symbolizing the triumph of the martyrs; the letters SL and a gridiron, representing St Laurence; and the first three letters in Greek of the name Jesus. 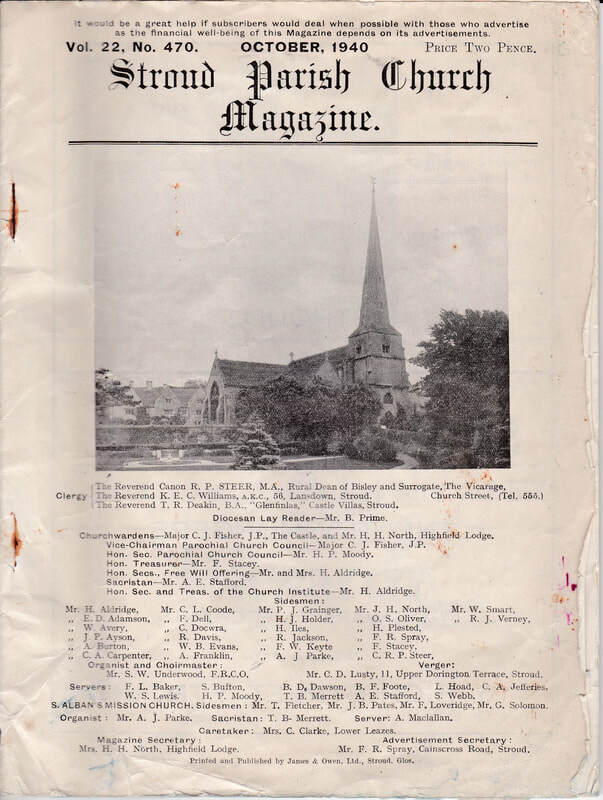 The current church organ is a fine three-manual instrument built and installed by Norman & Beard of Norwich in 1906, to a specification by Dr Charles Harford Lloyd. It replaced the original organ which had been installed by John Avery of Westminster in 1798. It was subject to a major refurbishment in 1996, when it was converted to an electro-pneumatic action, and in April 2016 further repair work was done to the bellows. 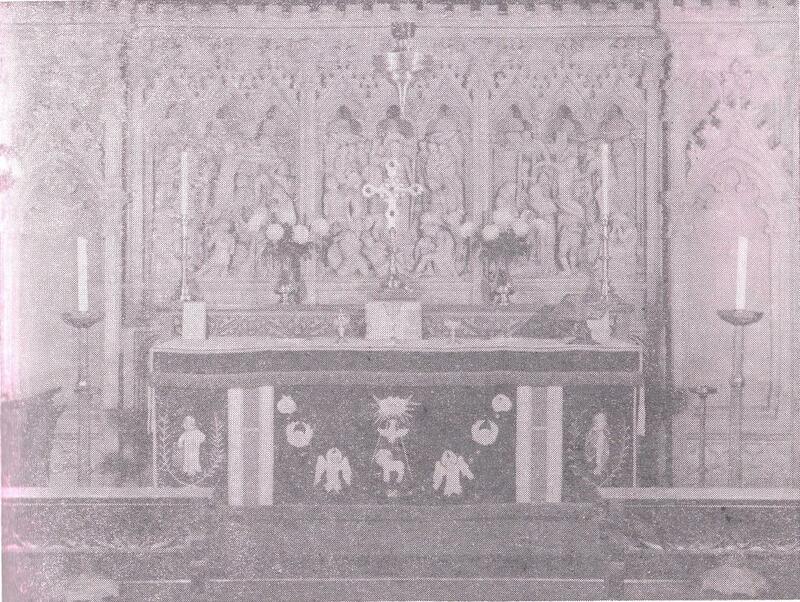 ​The Rood Screen and Cross were installed between 1910 and 1914, thanks to the generosity of the local Stanton family. They were created by the Cheltenham architect William Samuel Weatherley, and were donated by the Stanton family in memory of Father Arthur Henry Stanton. 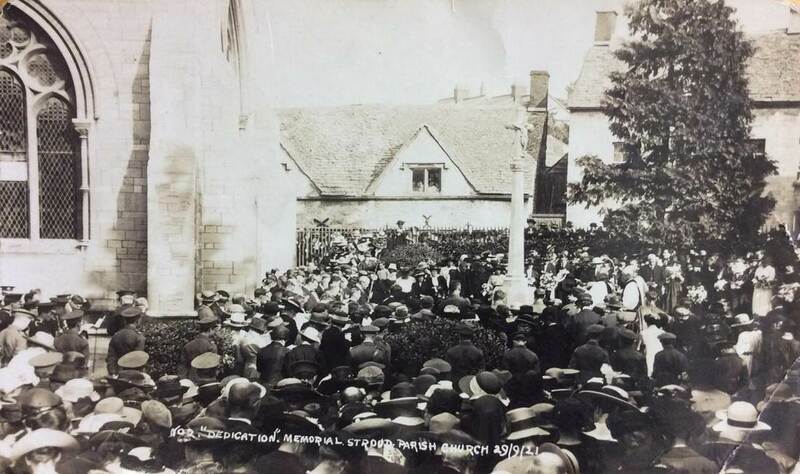 The War Memorial in the church grounds was unveiled on 29th September 1921. ​The oak screen filling the tower arch was designed by the architect Thomas Falconer in partnership with Baker and Campbell, made by Peter van der Waals in the Arts and Crafts style, and dates from 1927. The painting of St George in the tower arch screen is by Edward Raymond Payne of Box, and dates to 1929. Payne was a renowned artist, associated with the Arts & Crafts Movement, who spent most of his working life living in Box, Stroud, where he specialised in stained glass, painting, and teaching. 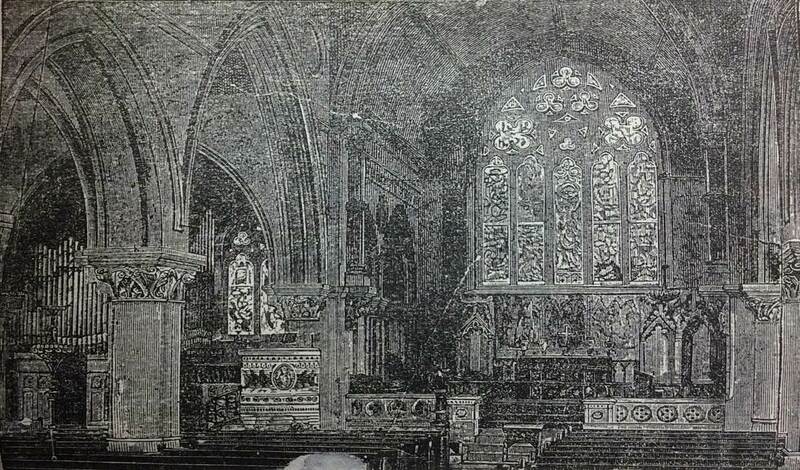 RIGHT: Engraving of the church interior before 1912 (when the rood screen was installed); the view is from the South Porch, looking across the nave to the north-west corner of the church. early 1900s (now a public car park). 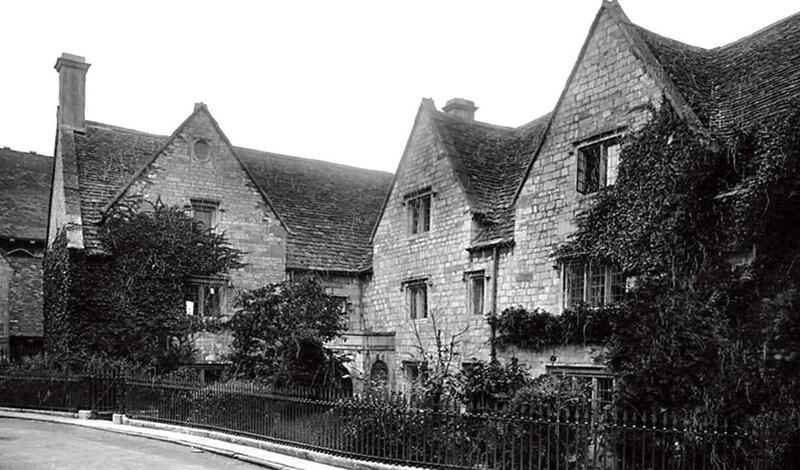 These almshouses fell into disrepair shortly before the start of World War II, and a start was made to restore them. However, by 1939 the supply of necessary materials had dried up, water penetration occurred, and the condition of the buildings gradually worsened. 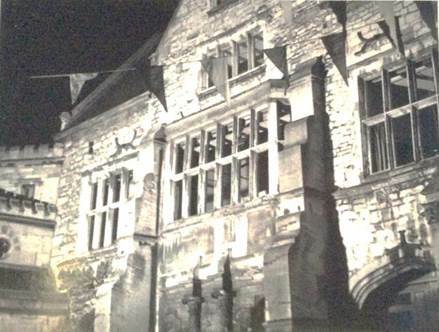 By 1955 they were standing only up to window-sill level, and final demolition soon followed. The oak screen filling the tower arch was designed by the architect Thomas Falconer in partnership with Baker and Campbell, made by Peter van der Waals in the Arts and Crafts style, and dates from 1927. 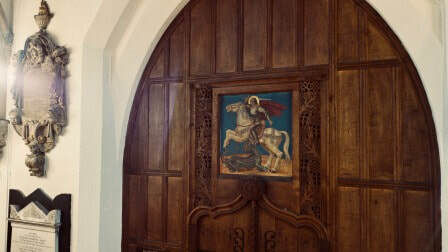 The painting of St George in the tower arch screen is by Edward Raymond Payne of Box, and dates to 1929. Payne was a renowned artist, associated with the Arts & Crafts Movement, who spent most of his working life living in Box, Stroud, where he specialised in stained glass, painting, and teaching. 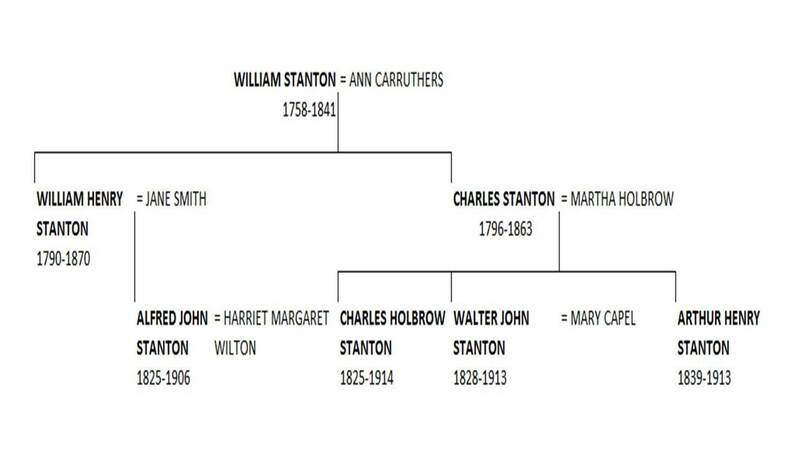 The Stanton family have been associated with the church from the 1820s, when William and Ann Stanton of The Thrupp were significant benefactors. 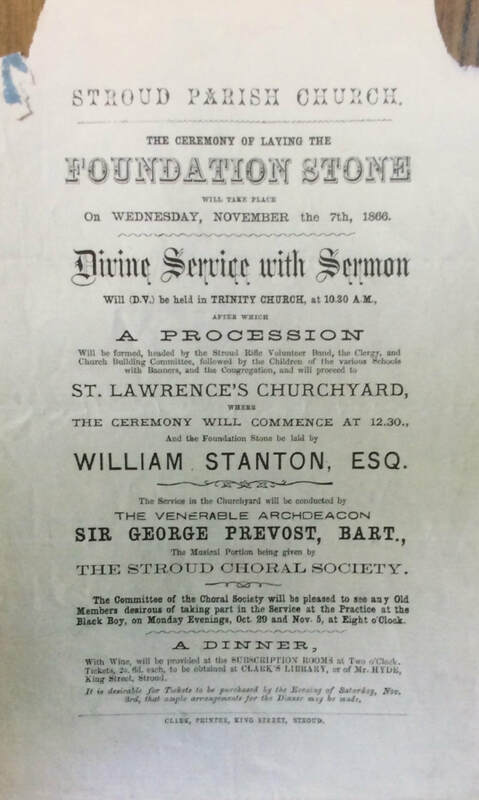 The Stanton family were a prominent local family associated with cloth manufacturing and politics: William Henry Stanton, son of William and Ann, was MP for Stroud between 1841 and 1852; and his nephew Walter John Stanton was MP for Stroud briefly in 1874, and from 1880 to 1885. 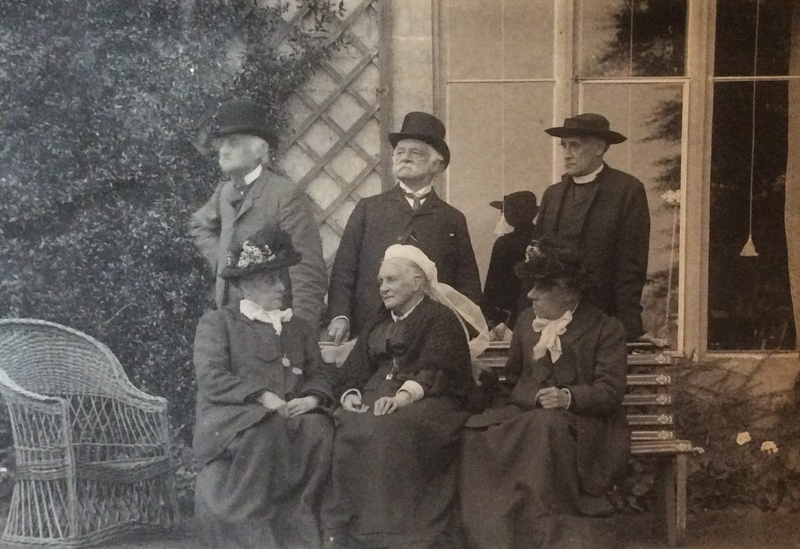 ​Arthur Henry Stanton, a grandson of William and Ann, was born at Upfield Lodge in Stroud in 1839. 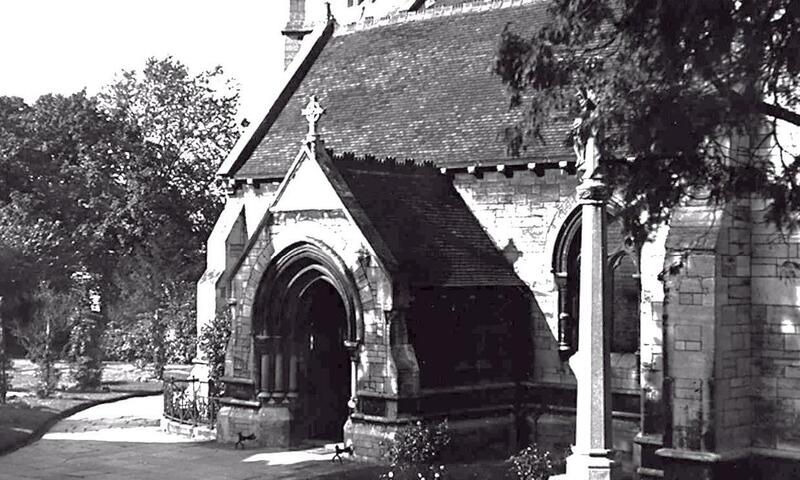 He became curate at St Alban’s in Holborn, London, in 1862, and was to remain there for over 50 years. He was a very popular and respected man, described as an indefatigable champion of the poor, a staunch champion of ritual, and an exuberant preacher, attracting devoted supporters and horrified critics in equal measure. 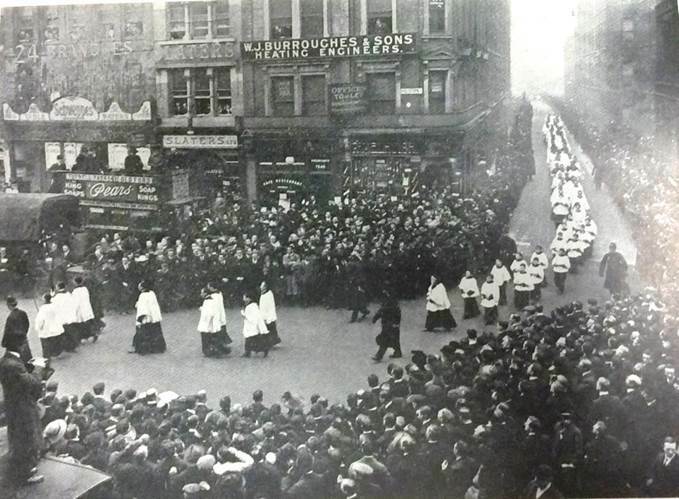 He died back in his native Stroud on 28th March 1913, and his funeral in Holborn was followed by huge crowds. 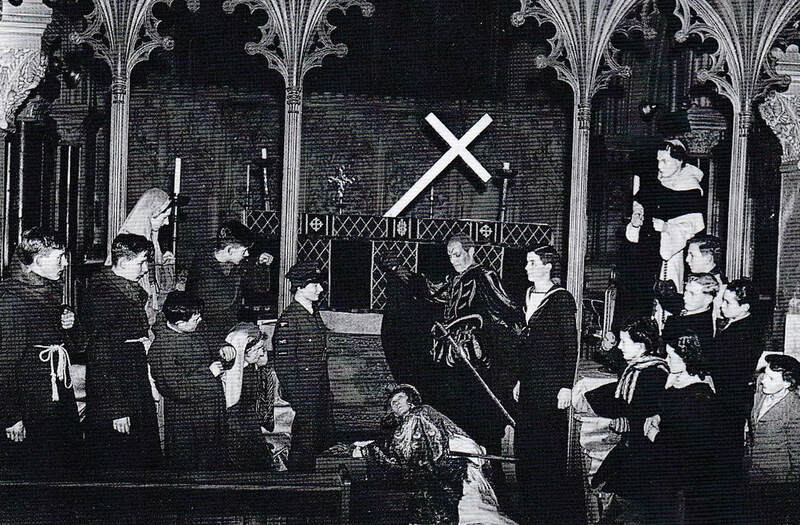 The wooden rood screen between the nave and the choir was donated by the Stanton family in 1912, and the cross above it was added in 1914 in memory of Arthur Henry. Centre - Preaching in Painswick Churchyard on "Clipping Day"
​The chancel window and a monument in the west wall of the church are in memory of William and Ann; the window in the Lady Chapel is in memory of Charles Stanton, by his surviving wife Martha; and windows on the north side of the church are dedicated to Alfred John Stanton and his wife Harriet, and Charles Holbrow Stanton, and Walter John Stanton and his wife Mary. ​The Chancellor: Do you contend that it is illegal to put candles in the candlesticks? Mr Stuart: Well, I am not prepared to press that to-day. The Chancellor: You suggest that you cannot light a candle without a ceremony. I think that you can. 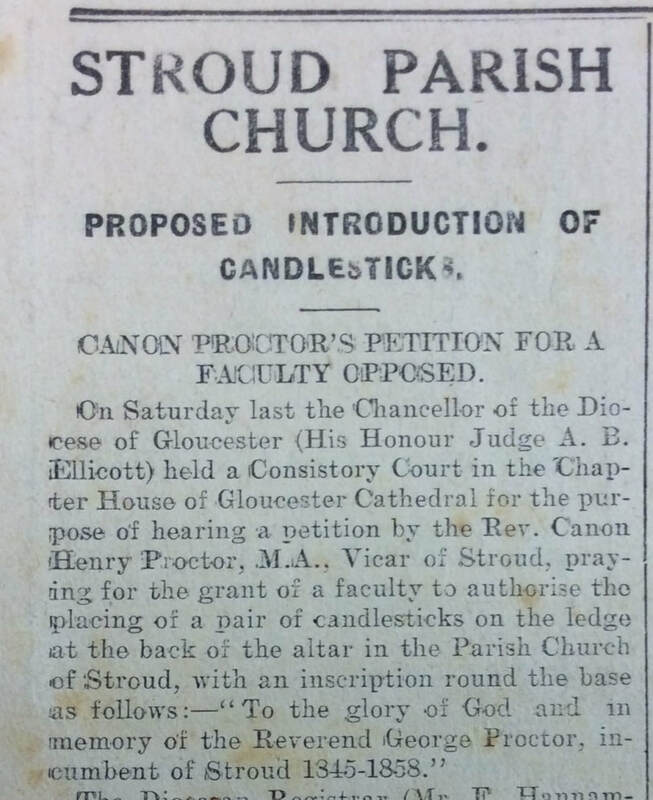 Mr Stuart: It has been held that it was illegal to place lighted candles on the Communion table during the celebration of Communion, if they were not wanted for the purpose of giving light, and it has also been held that candlesticks are not ornaments within the meaning of the Rubric. 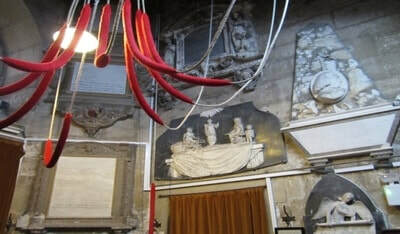 These lights were introduced by Innocent III., and were always used “ceremonially,” which was clearly forbidden by Martin v. MacKonochie in the House of Lords, which distinctly decides that the lighting of candles and the burning them throughout with reference to a service is illegal, and, as admitted by the Archbishop of Canterbury, in his evidence before the Royal Commission, this was not altered by the House of Lords in read v. Bishop of Lincoln. The Chancellor: It seems to me that if candles are illegal, candlesticks must be illegal too. Candlesticks clearly import candles. 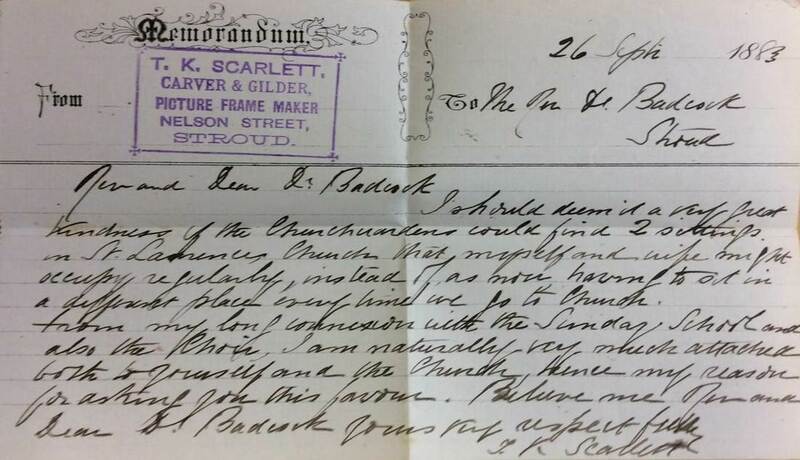 Mr Stuart: Candles are symbolical, and I should submit that if the grant of candlesticks would imply the right to put candles in them and to light them, they are not allowable. The Chancellor: The whole thing is illegal? Mr Stuart: Yes, I submit so. 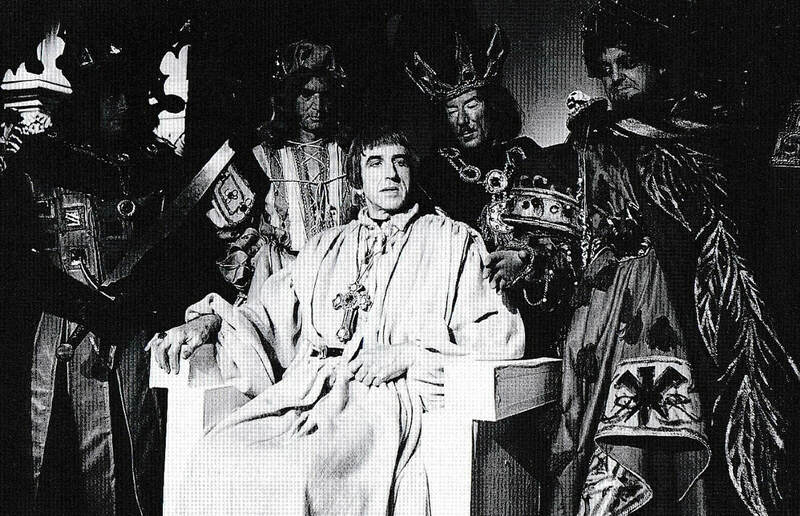 The Chancellor: It is a very serious thing, because in a great many churches there are, at all events, candles. 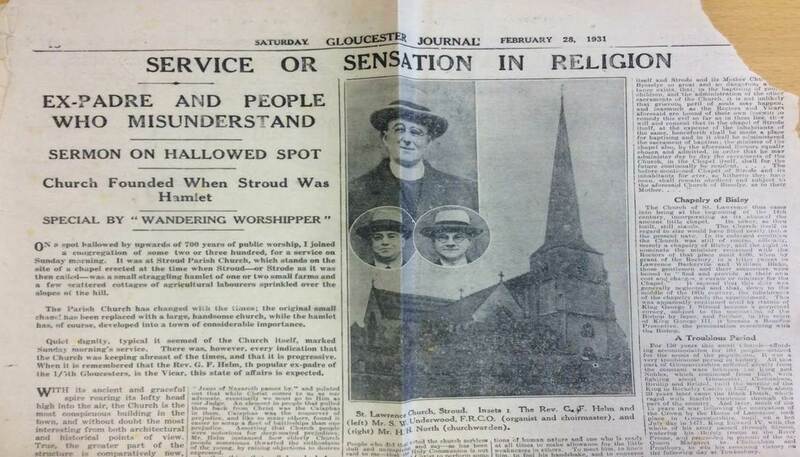 There was no permanent residence for the clergy until 1837, when a church house was built on Lansdown. 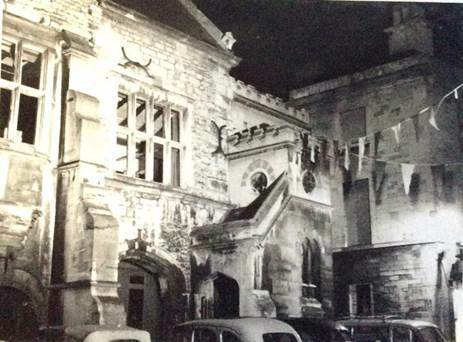 This was demolished in about 1967 to make way for an extension to Stroud Library. 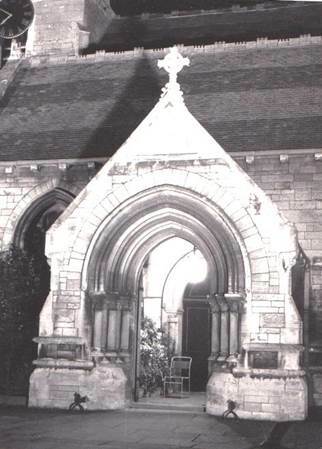 In 1912, the then vicar Henry Proctor bought Rodney House (originally built in 1634) next to the church, and this was later bought from him by the diocese for use as the vicarage. The Rodney House vicarage later became the Church Court Care Home, and a new modern vicarage was built nearby to replace it. 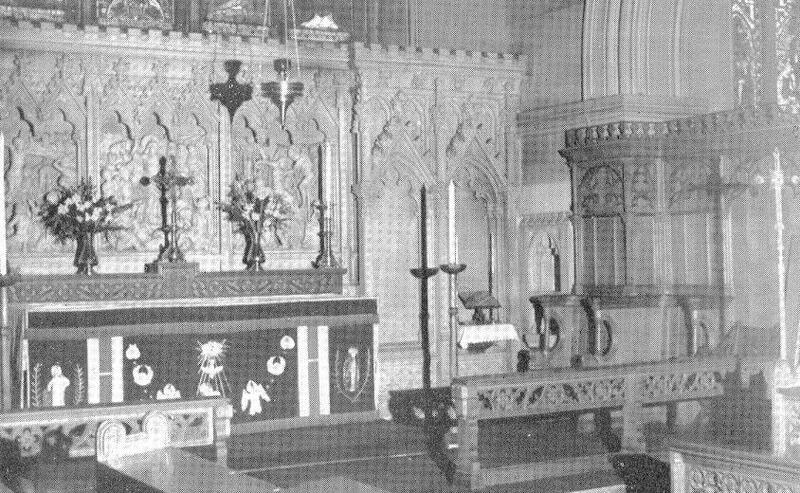 LEFT: The Sanctuary Lamp - The dedication reads: “The Sanctuary Lamp in this Chapel was given in memory of his mother Catherine Emma, by George Francis Helm, Vicar of this Parish and dedicated by him on the Sunday after Ascension Day [14 May] 1931”. Catherine had died in 1929. 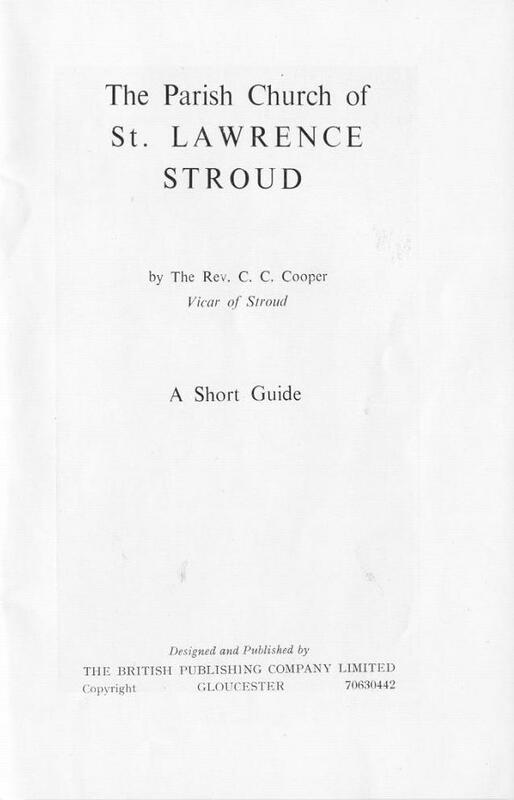 A St Lawrence (Stroud) Scout Troop was started in 1928 by Rev Arthur Braybrooke, with 17 scouts and 22 wolf cubs, and ran briefly up until 1931. 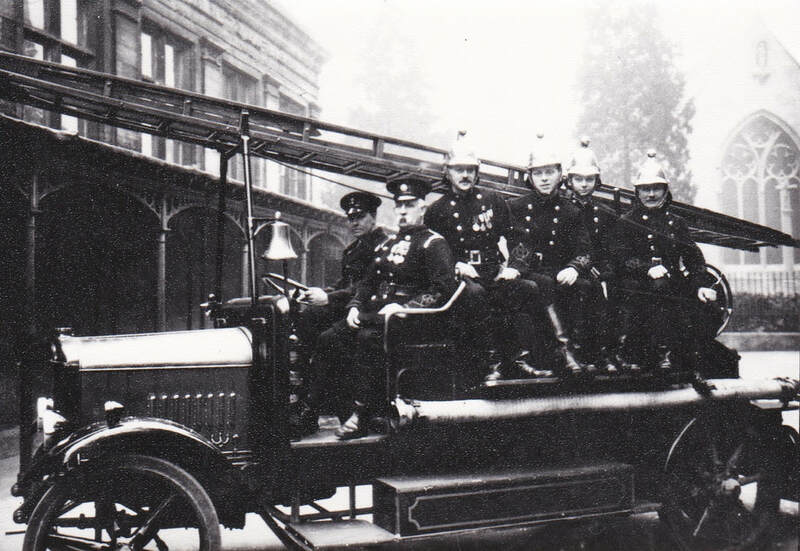 In 1937 it was revived by Netlam Bigg and was based at St Alban’s church hall, and St Laurence Church Institute. It was later given a half-acre piece of land owned by Mrs Bigg in Hollow Lane, which contained a large hut with a hall and meeting rooms, some greenhouses, and a smaller hut. The greenhouses were later converted into a kitchen, toilets and storeroom. Albert William Charles Matty – A Driver/Mechanic with the Royal Army Service Corps, who was aged 23 years when killed by a rifle accident at Newbury, Berkshire, on 23 July 1940. 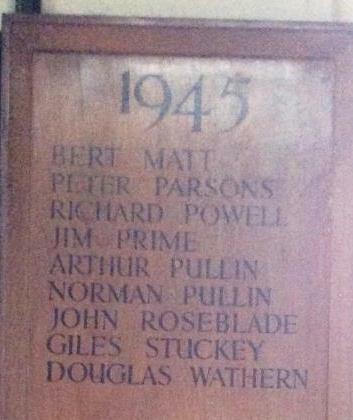 He was the son of Selina Ann Matty, and stepson of William Arkle, of Stroud. He is buried in Stroud Cemetery. John Albert Roseblade – A Guardsman with the Coldstream Guards, he was aged 20 years when killed on active service on 21 April 1944. 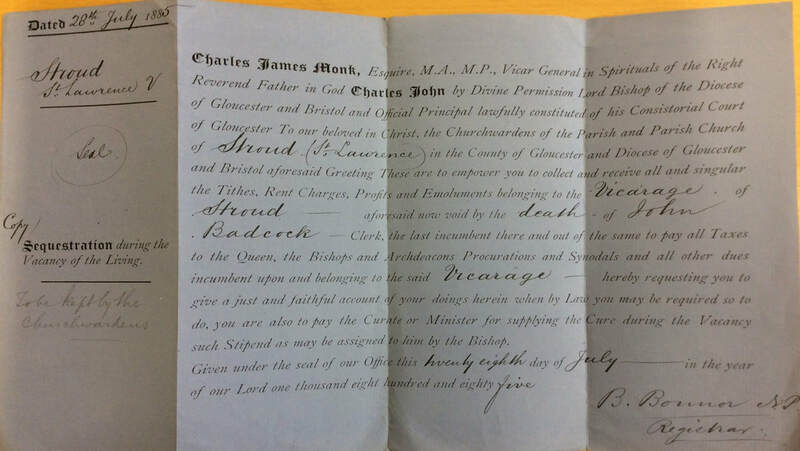 He was the son of George William and Bertha Elizabeth Roseblade of Stroud. He is buried at the Cassino War Cemetery in Italy. John Keith Wilmot – A Lieutenant in the Royal Artillery, he was aged 26 years when killed on 22 June 1944. 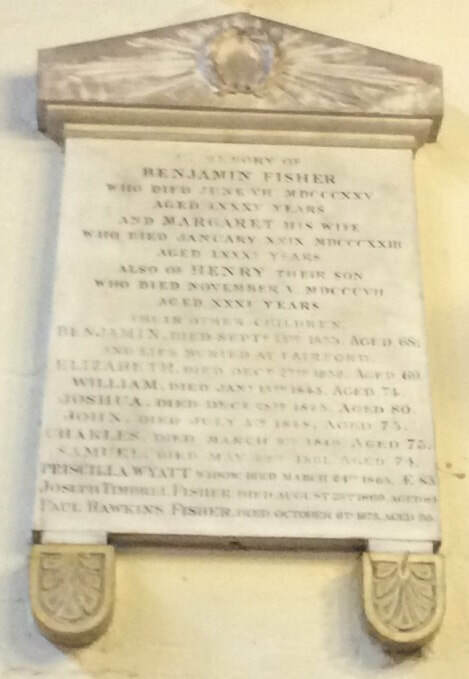 He was the son of John Harry and Gwendoline Wilmot, and husband of Constance Elizabeth Wilmot, of Weston-Super-Mare. He is buried at the Ranville War Cemetery in France. His wife, Constance, died at Weston-Super-Mare in 1994. Alec Norman Jennison – An RAF Volunteer Reserve, who was aged 24 when lost and believed killed while flying on a naval exercise over the Irish Sea on 16 April 1945. 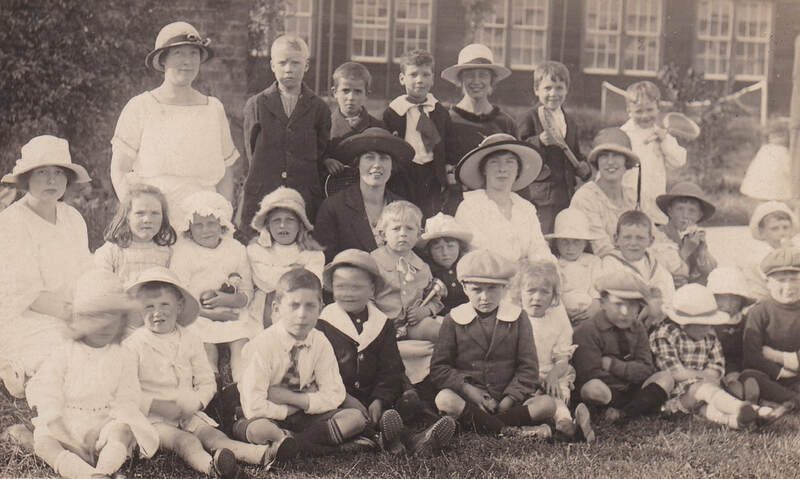 He was the son of Hubert and Doris Bentley Jennison of Guiseley in Yorkshire. 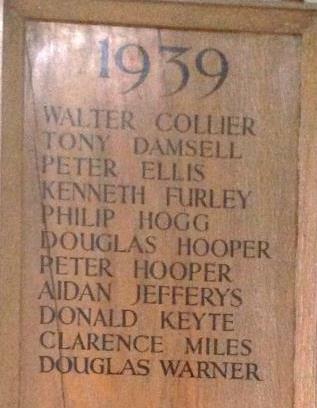 His name is commemorated on the Runnymede Memorial in Surrey. 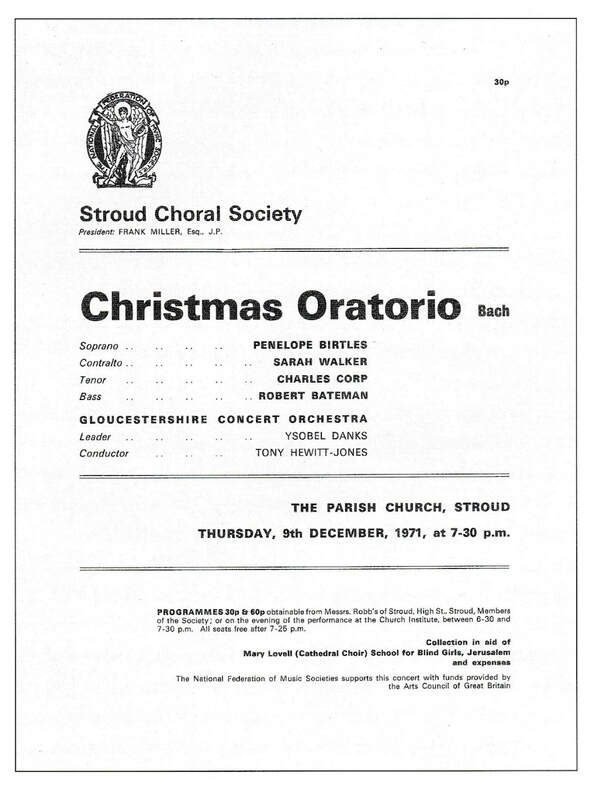 Stroud Choral Society used the Subscription Rooms as their main venue until 1939 when, with the outbreak of World War II, the rooms were requisitioned for other uses. 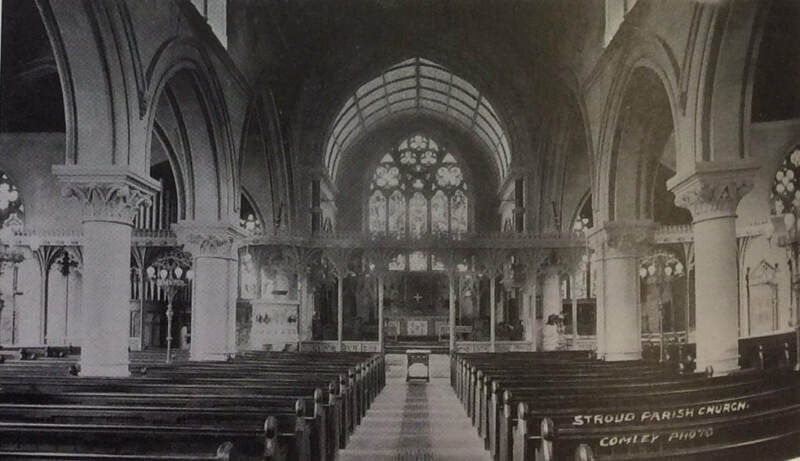 The concert venue then became St Laurence, and a wartime tradition of popular Sunday afternoon concerts began (it was impossible to ‘black-out’ the church for evening concerts). 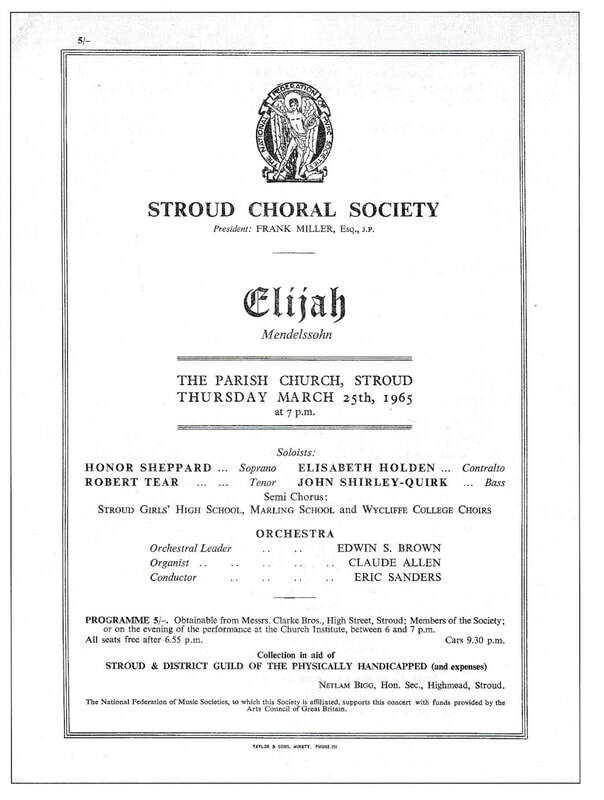 The concert on 15th March 1942 of Elgar’s “The Music Makers” and Vaughan Williams’ “Benedicite”, featured an appearance by Dame Isobel Ballie, the Scottish soprano who was popular in opera, oratorio and lieder, and who is regarded as one of the 20th century's great oratorio singers. 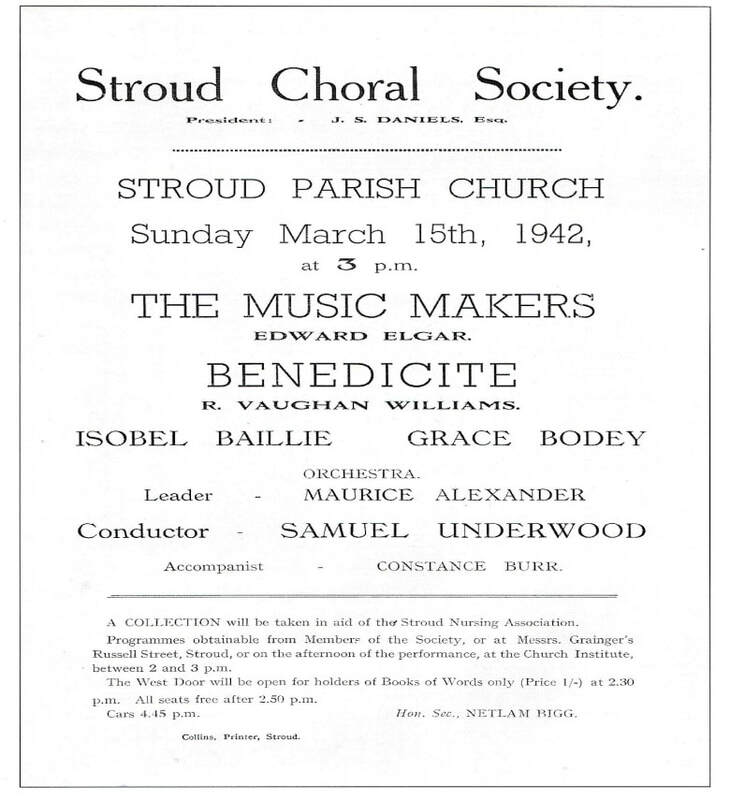 Samuel William Underwood was famously Organist of St Laurence and Conductor of Stroud Choral Society between 1906 and 1958, being awarded an MBE in 1957 for his contribution to music in the West Country. 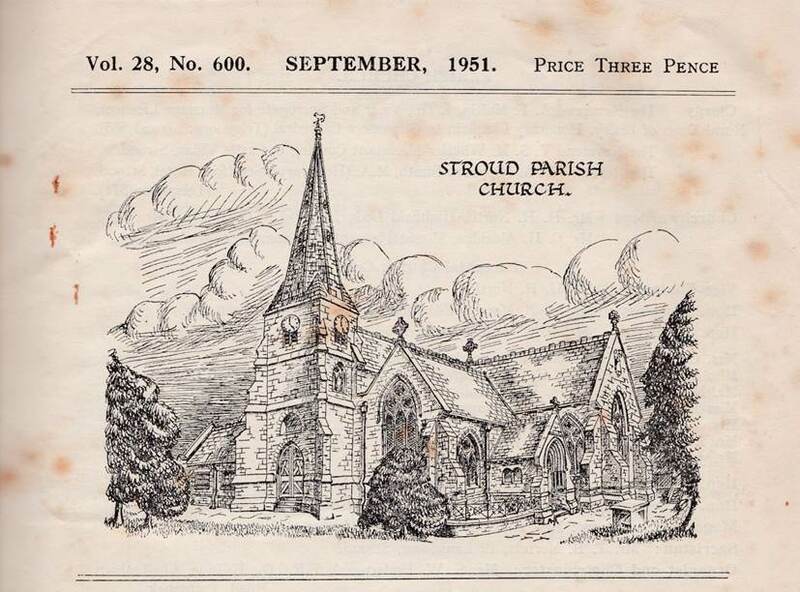 The Stroud Religious Drama Festival was founded by Netlam Bigg in 1946, and between then and 1973 a series of annual dramas were staged in St Laurence. 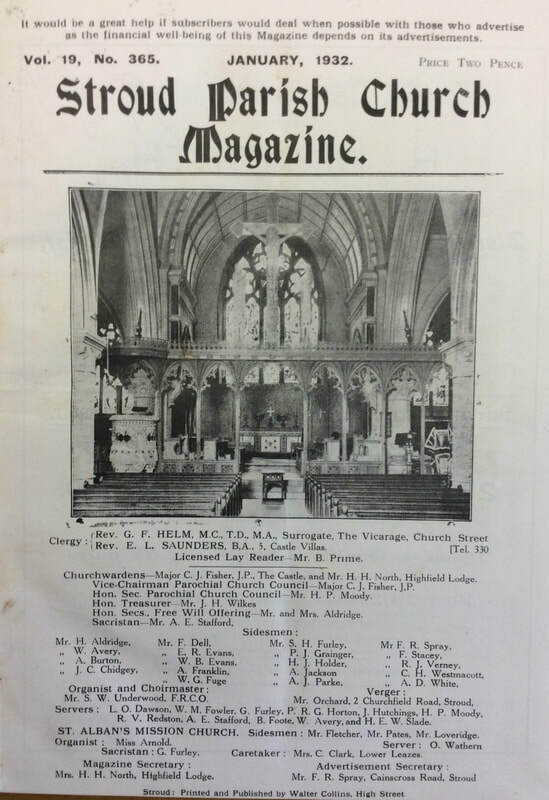 In later years it also included an exhibition of local religious art in the church hall. 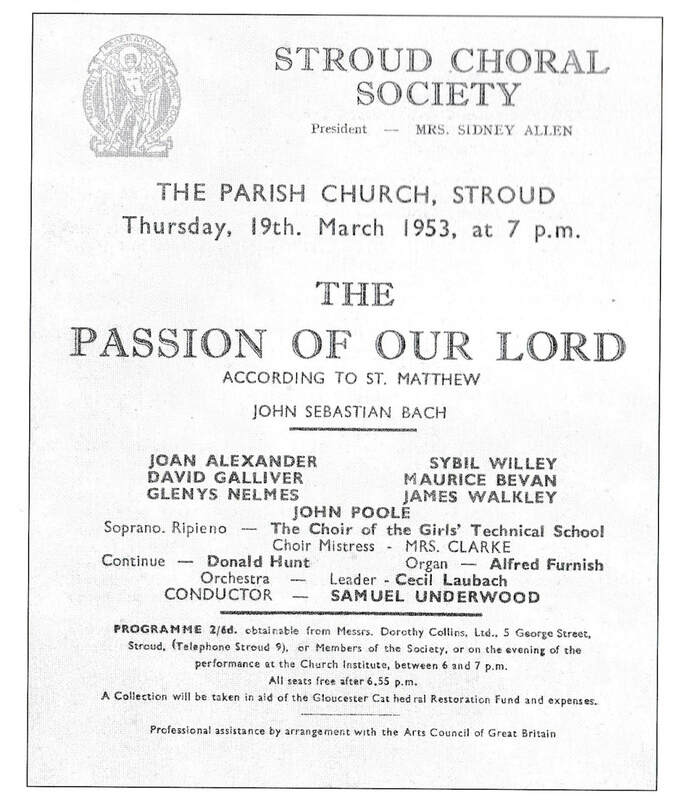 The first performance between 11th and 14th March 1947 was of “I Will Arise” by local author, Thomas Baden Morris. This had been written for Coventry Cathedral, and was first performed there within its blitzed ruins. It portrayed a modern allegory of the fight of the Christian faith in a war-ravaged world, based around a duel between St Michael and the Devil. Actors from The Cotswold Players were supported by some senior boys from the St Lawrence Scouts and the Church Youth Club. 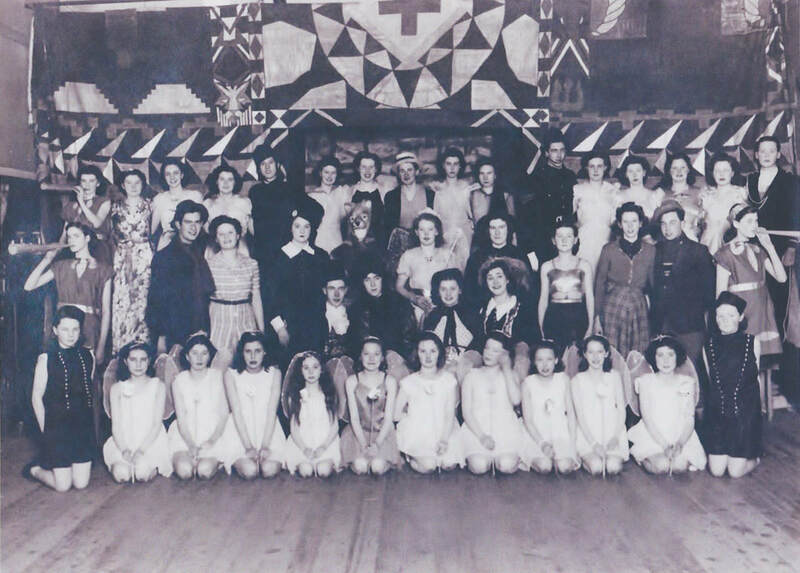 It meant constructing a special stage for the event made from wooden crates donated by Stroud Brewery, which were clamped together and faced with plywood. 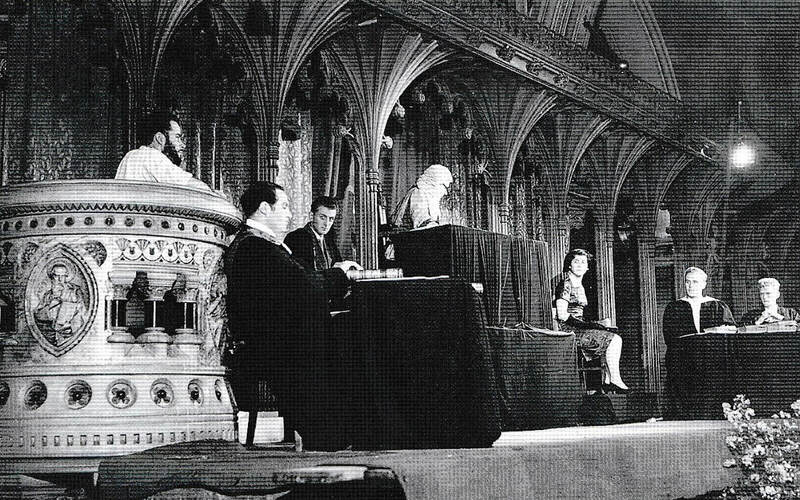 The stage was stored in the old Town Hall, and carried to the church in sections for assembly. 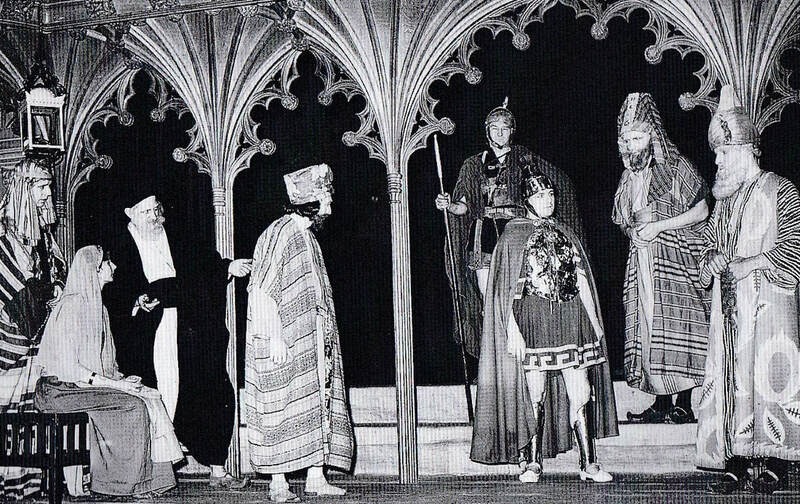 By 1961, the Festival was attracting in excess of 3,000 visitors from all over the UK. It was the forerunner of today’s Stroud Festival. 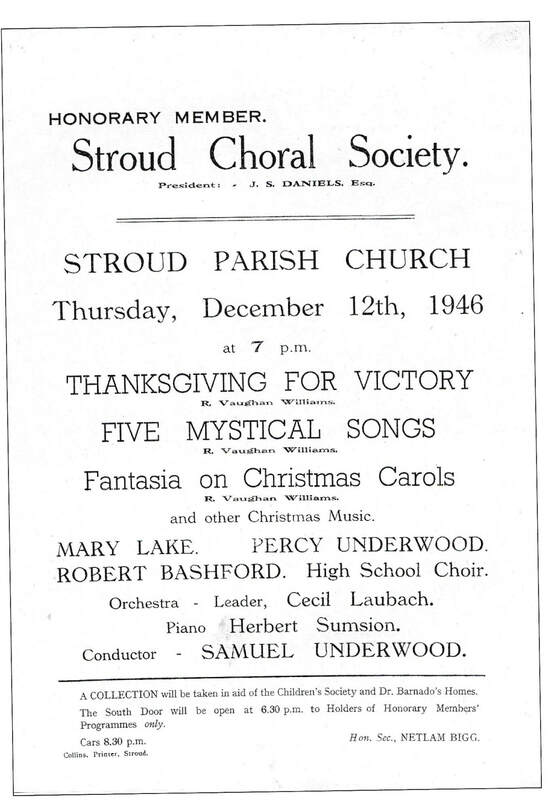 The 1958 Stroud Festival performance at St Laurence was tinged with some sadness at the passing away of Samuel Underwood earlier that year. It also saw the dedication of a new altar frontal and cloth. 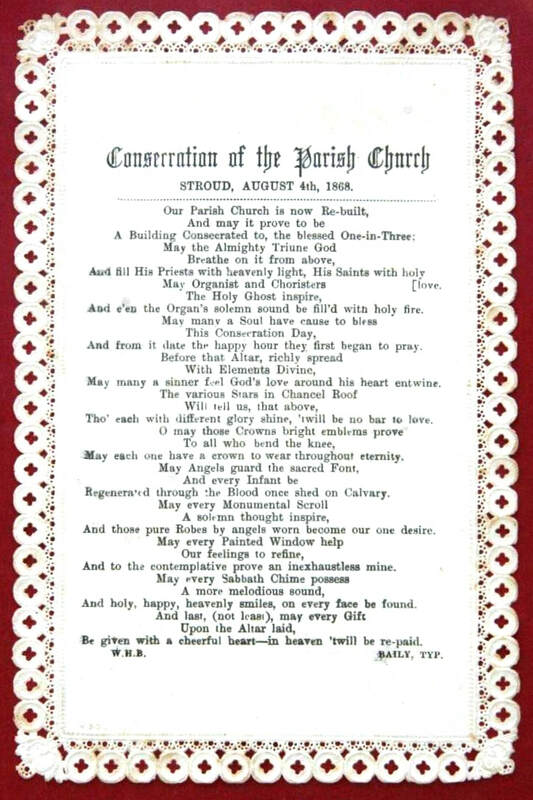 In front of a crowded congregation, Marjorie Cox addressed the vicar, Arthur Maltin: “Reverend Sir, will you please accept this Altar frontal and Fair Linen cloth, designed and embroidered by senior girls of the Stroud Technical School, on cloth made at and presented by a local cloth mill, and ask the Lord Bishop [of Gloucester – Dr WM Askwith] to dedicate them to “the Glory of God” and in memory of our late headmistress, Miss Heather Trout, who with the School was closely associated with the Stroud Religious Drama Festival.” Due to television coverage, the new altar frontal attracted much attention and it was later displayed at the Three Choirs Festival, and exhibited at an exhibition of contemporary church embroidery in East Grinstead, Surrey. 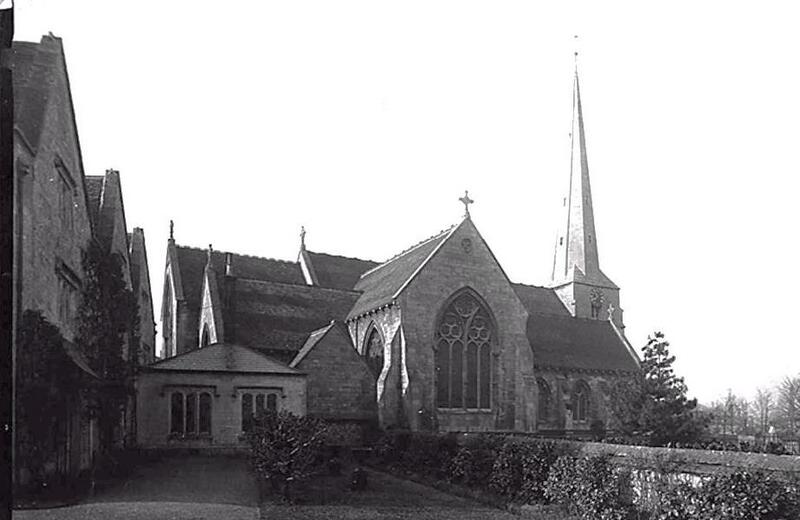 In May 1965, worshippers at St Laurence were confronted with a notice asking visitors to "refrain from eating fish and chips", put up by the new vicar John Edwin Tillett. He was concerned about the growing problem of people using the church as a venue for eating their lunch and then leaving litter behind. He said the church porch was left with a bad smell and that chicken bones and fish and chip papers were left in the Easter garden. ​- where a local market has been held almost continuously since at least the 16th century. 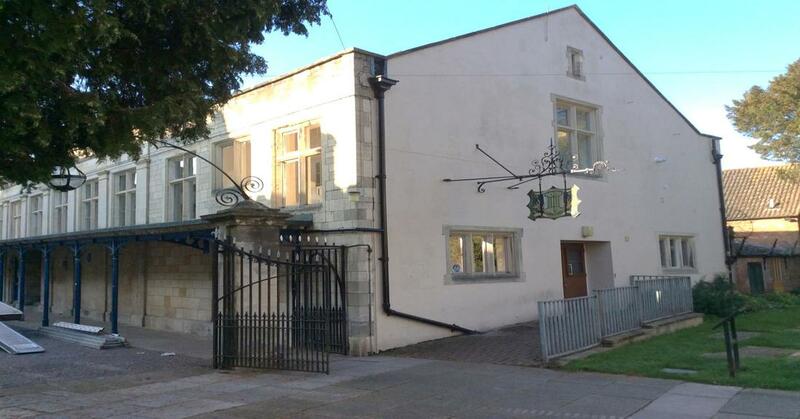 On the east side is the old market house dating to about 1590, which has also been used in its time as a school, and, up to 1989, as local council offices. 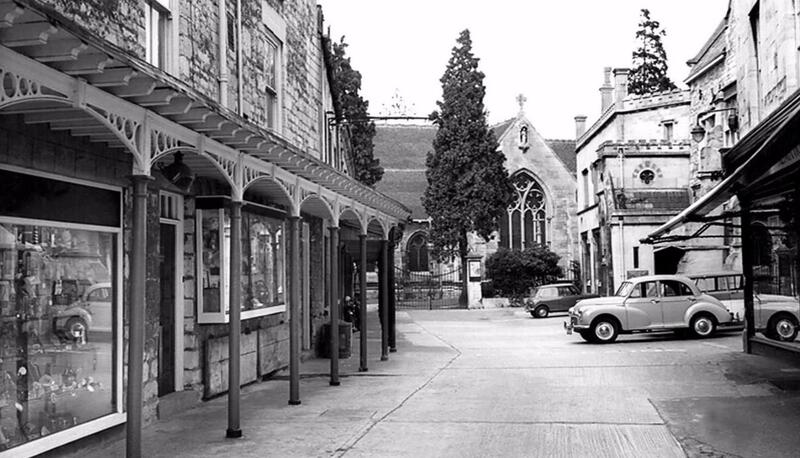 On the west side is the church hall, originally The Butchers Arms public house, and then the Corn Hall. The last remaining hinged butcher’s table is fixed to the wall under the 19th century arcade. In June 1742, The Shambles was the site of a sermon preached by John Wesley. A plaque on the church hall commemorates how Wesley made use of a butcher’s block to stand on as he preached his first Stroud sermon. 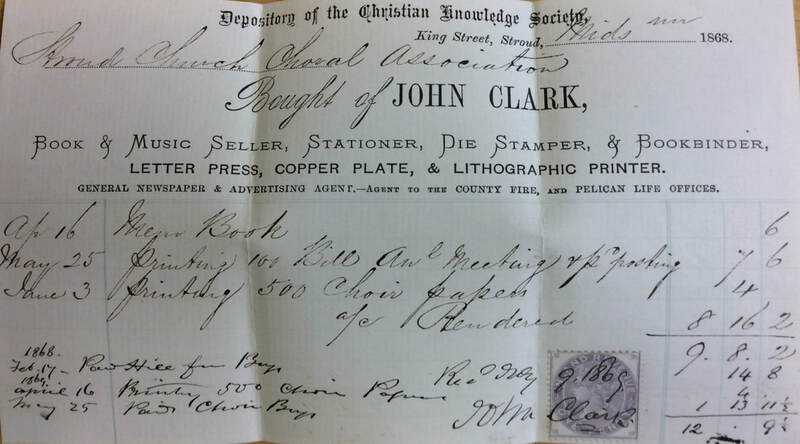 He returned frequently to the town during the mid 18th century, where a strong Methodist following had developed. 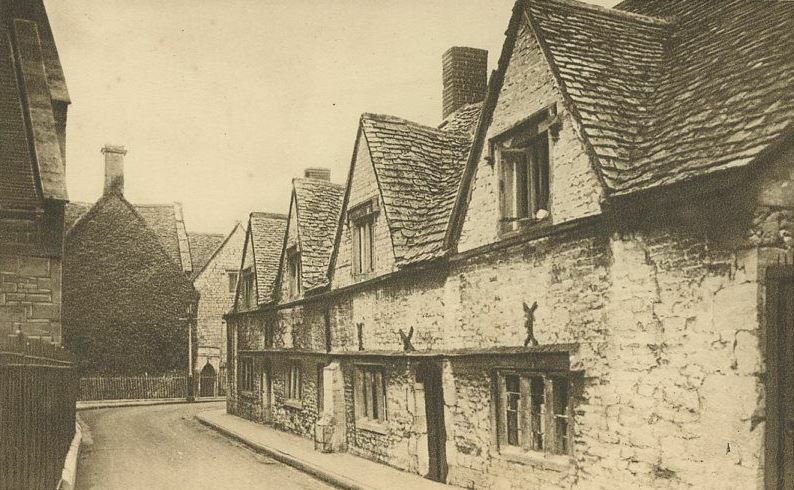 According to the Stroud News & Journal, Roman tiles were unearthed from the grounds of St Laurence Church in Stroud in 1976, when the new Vicarage was being built. Several pieces of Roman hypocaust tiles were discovered by Peter Young and his son, Timothy. One piece appeared to have original plaster still adhering to it. It came after several findings of Roma relics in the area. 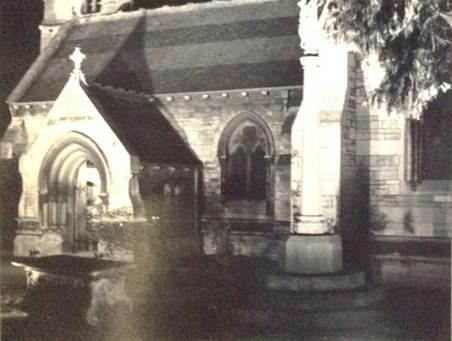 The tiles were handed to Stroud Museum, which later commented that the tile fragments, hypocaust tiles, roof tegulae, and floor bricks came from the upper layer of the old burial ground, which appears to have been raised in 1866 when the Church was rebuilt. It is known that soil was brought in from the West Grange villa in 1866 and so it was considered that this Roman material is likely to be displaced material from West Grange. 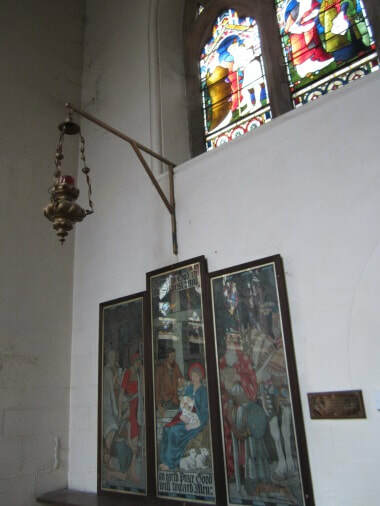 In October 2004, thieves abused the open-door policy of the church to steal an antique clock in a brazen raid. 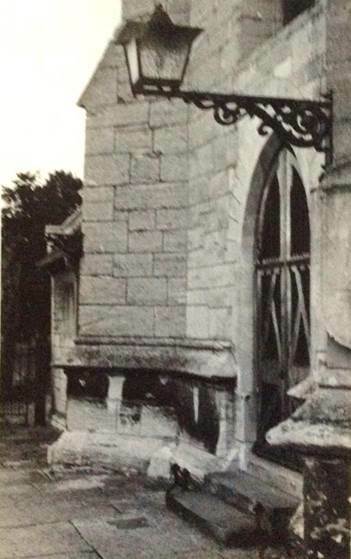 The thieves took the clock, estimated to be worth more than £300, from its spot in the bell tower of the church. 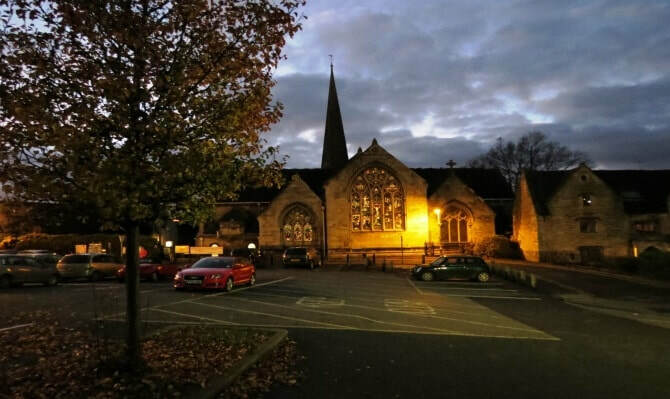 The theft, which was discovered on the evening of Wednesday 27th October, was the second to occur in a few weeks after a wheelchair used by the church to help parishioners was also stolen. “This kind of petty theft is annoying,“ said Father Barry Coker. “We try to keep the church open because it is important to keep that space open in the centre of the town. We feel strongly that a church should not have its doors shut but this means we do take risks. In 2005, the church suffered at the hands of an arsonist, who started fires in three places around the building, causing significant damage. This took place on a Tuesday evening just as bell-ringing practice was ending. Laurence Hitchins, the Tower Captain, emerged from the tower into the main church just as Father Barry Coker emerged from the vestry. 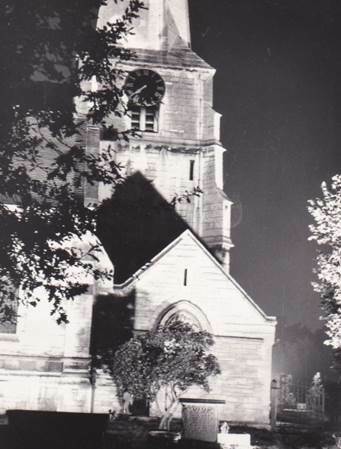 Through the smoke they could see a shadowy figure at the other end of the church. The current nave altar is a replacement for one that was severely damaged in the fire, and the grid on its front incorporates some of the scorched wood from the original altar. It was made by Matthew Tradgett of Cheltenham. The curtain behind the altar in the Lady Chapel was reluctant to burn, but still bears witness in one corner to the attempt to set it alight; and one of the wings of the lectern eagle is a little crumpled as a result of it being tipped over onto the tiles of the floor. ​High winds and torrential rain hit Gloucestershire in the early morning of Sunday 29th April 2012. In Stroud, a large cypress limb smashed into the roof of St Laurence Church Hall. The large tree split at around 10.30 am and the bough came to rest against the hall roof. "We still have to assess if there's any damage," said church warden Mike Lambert. "We're having work done retiling the hall roof any way just now." Tree surgeons removed the cypress the following day. 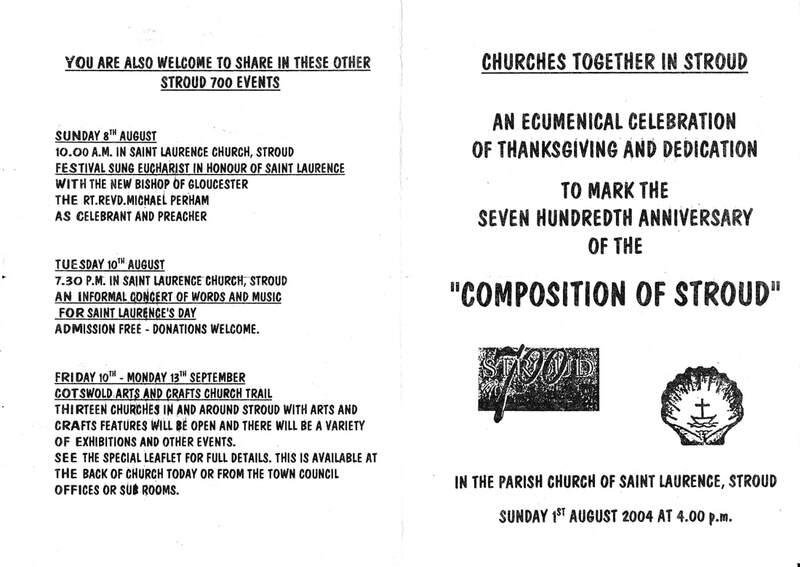 St Laurence today retains its character as a Festival church for Stroud. The first of what was to become an annual Community Christmas Tree Festival began in 2005, when 30 decorated trees were officially switched on by Councillor John Marjoram, Vice Chairman of Stroud Town Council. Now boasting around 140 trees from various local businesses, organisations, groups and individuals, and attracting thousands of visitors from all over the UK, the festival will celebrate its 14th year in 2018. 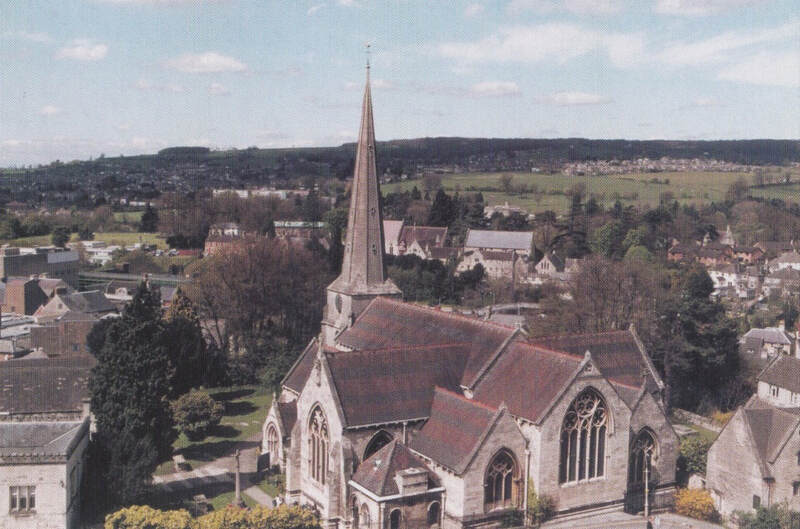 More recently, it has become the established home of the Stroud Sacred Music Festival (now in its 4th year), showcasing over two days live sacred music from a variety of faiths, brought together in a spirit of peace and tolerance. 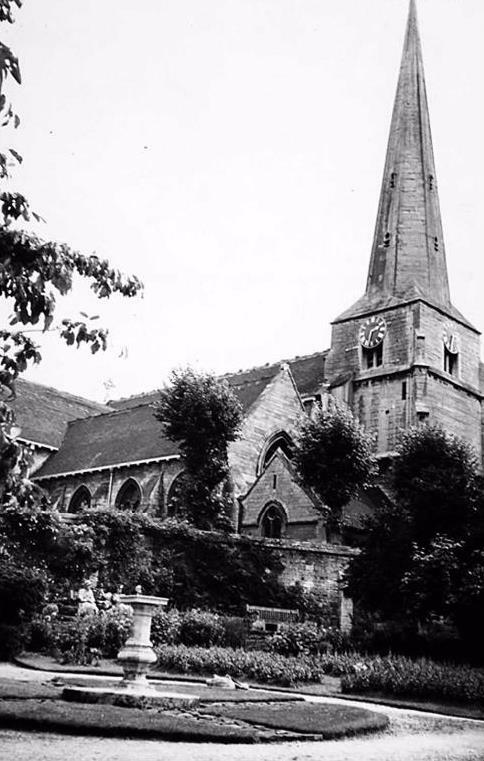 In 2016 the church made a popular debut for the Stroud Fringe Festival. Back in July 1967 the church was threatened with demolition when a commission under the direction of the Archdeacon of Gloucester recommended that the church and vicarage be made pastorally redundant, and, if a structural and architectural survey justified it, the buildings be demolished and the land sold. 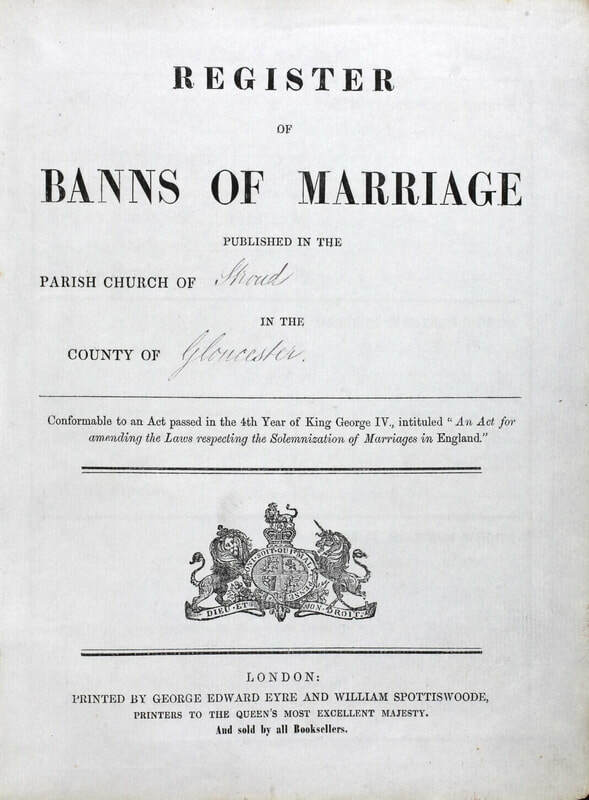 After an intervention by the Rt Revd Basil Guy, Bishop of Gloucester, and pleas from the Parochial Church Council and congregation, the church was saved. 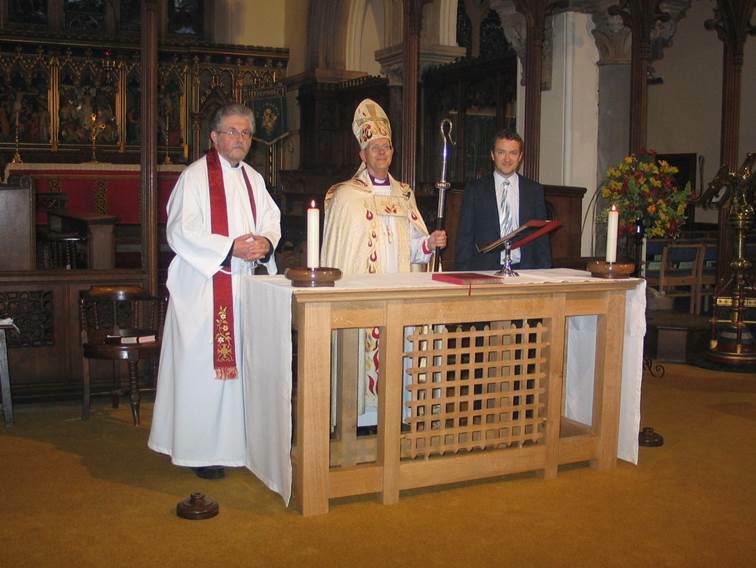 Stepping forward from those dark days to more recent times, in 2014 Parochial Church Council voted for the removal of the church pews, in order to make a friendlier and more welcoming space for worship. The new flexible space generated by the removal of the pews, also means that the church can be used by the wider community for other events such as concerts and exhibitions. This was the first step towards what became the ‘St Laurence: The Future’ project launched in 2016, which aims over the coming years to develop the building as an integral and thriving part of the Stroud scene.